This part covers the Post-War and the Regulated and Protectionist Era and the Role of Government in International Civil Aviation with a focus on the Cold War Era. Often referred to as the “glory days of airline travel”, the Post-War and the Regulated and Protectionist Era witnessed the manufacture of large capacity, long-haul, piston driven aircraft, the introduction of and transition to commercial jet airliners that ushered in the “Jet Age”, and finally the development of high capacity, wide-bodied aircraft that started the path toward the end to economic regulation of the privately-owned U.S. airlines. In the United States, the trunk carriers began the transition to peace-time operations, enjoying the technology developed during the war. 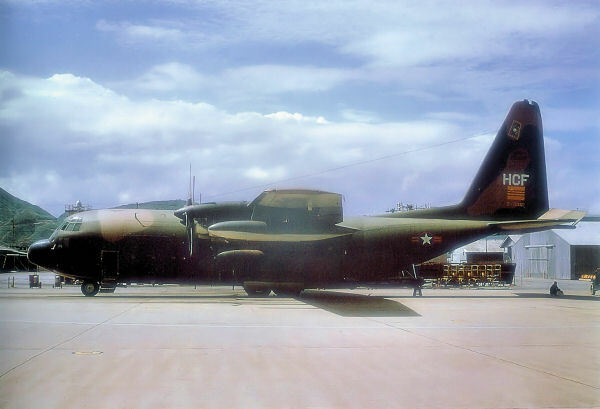 There was a surplus of former military transport and bomber aircraft that were acquired by the trunk airlines and modified for commercial service. These surplus aircraft were also purchased by entrepreneurs who began to transport people and cargo on an ad hoc basis, with no fixed routes or schedules. Thus emerged a new type air carrier to be known as the non-scheduled or “non-skeds” to the public or as “large irregular carriers” to the CAB, which was powerless to regulate them under the current statutes. This was remedied by an amendment to the Civil Aeronautics Act that created supplemental air carriers and supplemental air transportation requiring these carriers to possess certificates of public convenience and necessity in order to operate as an air carrier. 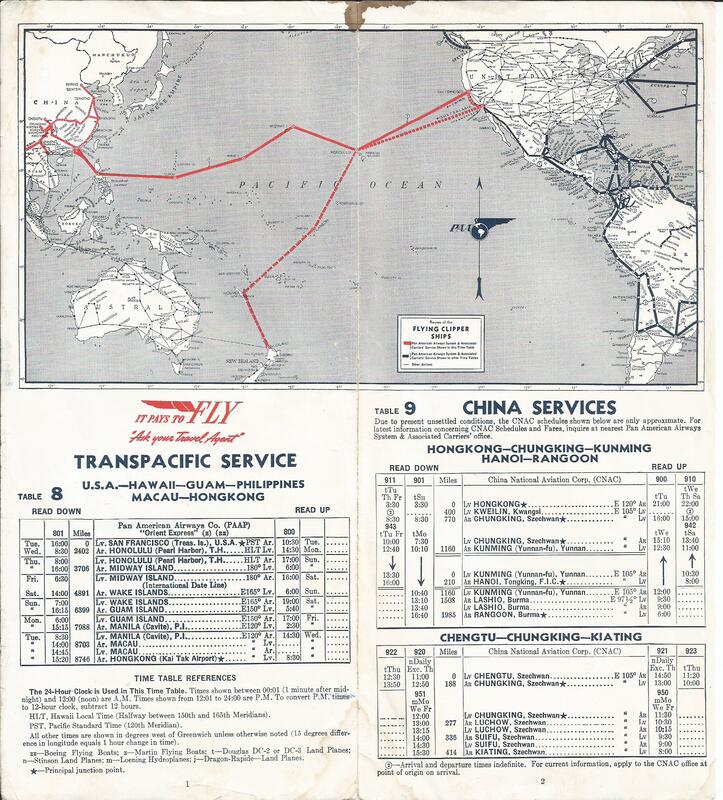 In addition, the post-war years witnessed the granting of new “feeder” routes by the CAB. Although the trunk carriers claimed a right to these routes under their grandfather rights, the CAB nevertheless granted these new routes to another new class of air carrier known as “Local Service Carriers”, each with a regionally centered route system. Airlines such as Allegheny, Mohawk, Lake Central, Frontier, Bonanza, Ozark and Southern were all certificated during the 1945-1951 period. Because of the thin markets served by these carriers, they were awarded subsidies to keep operating in these markets. These new air carriers, added to the already existing trunk carriers, meant an overcrowding of American airspace, and the regulation in place for air traffic control was soon considered antiquated. In 1956, U.S. President Dwight D. Eisenhower appointed Edward Peck Curtis as Special Assistant for Aviation and was named to head a commission to study the dramatic increase in airline traffic and to propose ways to deal with airplane traffic jams at airports. This was followed by and event, however, that shook the very foundation of air traffic control. On the morning of 30 June 1956, United Airlines flight 718 collided with TWA flight 2 over the Grand Canyon. 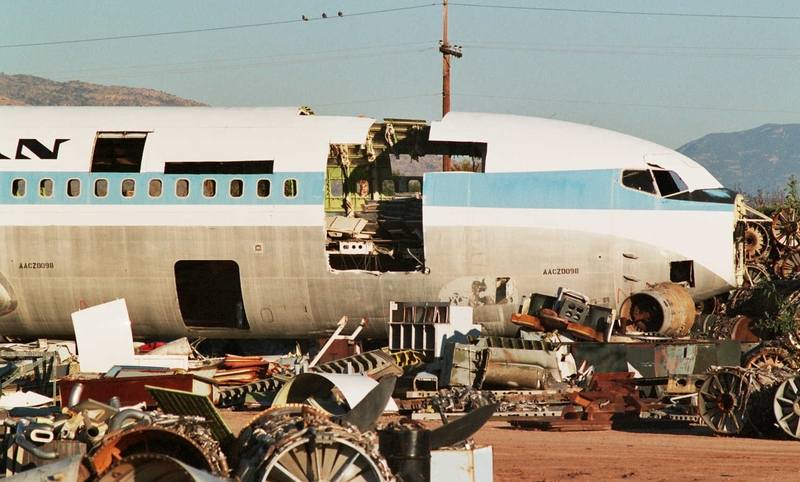 With 128 fatalities this was at the time the largest loss of life in an aviation accident. This high profile accident, which took place in uncontrolled airspace, raised public concern for airline safety. As a result, in 1957, Congress passed the Airways Modernization Act that established the Airways Modernization Board (AMB) headed by General Elwood Quesada. The mandate of the Board was the development and modernization of the national system of navigation and air traffic control facilities to serve the present and future needs of civil and military aviation. Two subsequent mid-air collisions between military aircraft and commercial airliners, one near Las Vegas, Nevada (United Airlines flight 736) on April 21, 1958, where 49 died, and another involving Capital Airlines over Brunswick, Maryland a month later on May 20 that cost 11 lives, showed further imperfections in the regulation of air traffic, particularly the need for unified control of airspace for civil and military flights. The day after the Brunswick collision, Senator Mike Monroney and Representative Oren Harris introduced the Federal Aviation Act and two days after Brunswick, a stopgap presidential proclamation was issued that (1) required military jet aircraft to fly by Instrument Flight Rules while in the civil airways below 25,000 ft. (later reduced to 20,000 ft.) and (2) prohibited jet penetration swoops from high to low altitudes through civil airways. Citing “recent midair collisions of aircraft occasioning tragic losses of human life,” President Dwight D. Eisenhower announced the White House’s support of the legislation on 13 June 1958. The Federal Aviation Act of 1958 passed Congress and was signed into law by Eisenhower on 23 August. Taking a comprehensive approach to the federal role in fostering and regulating civil aeronautics and air commerce, the new law repealed the Air Commerce Act of 1926, the Civil Aeronautics Act of 1938, the Airways Modernization Act of 1957, and those portions of various presidential plans dealing with civil aviation. The legislation assigned the functions exercised under these repealed laws to two independent agencies — a new Federal Aviation Agency (FAA) and a Civil Aeronautics Board (CAB). Established the Federal Aviation Agency (FAA, later Federal Aviation Administration). Abolished the CAA, and empowered the FAA to oversee and regulate safety in the airline industry and the use of American airspace by both military and civilian aircraft. CAB continued as an independent agency and retained jurisdiction over route allocation, accident investigation and fare applications. International routes subject to bilateral agreements between the US and the country involved and the CAB designated the carrier to operate the route. The twenty years following the Federal Aviation Act of 1958 was characterized as an era of strict economic regulation in the United States and government protectionism in the rest of the world. The privately owned U.S. flagged airlines were restricted by the CAB as to where they could operate and what fares they could charge. Routes were awarded after long and costly proceedings where a carrier needed to prove the market applied for actually needed the service. Fares were also subject to board approval and were calculated using a formula known as the Standard Industry Fare Level (SIFL). 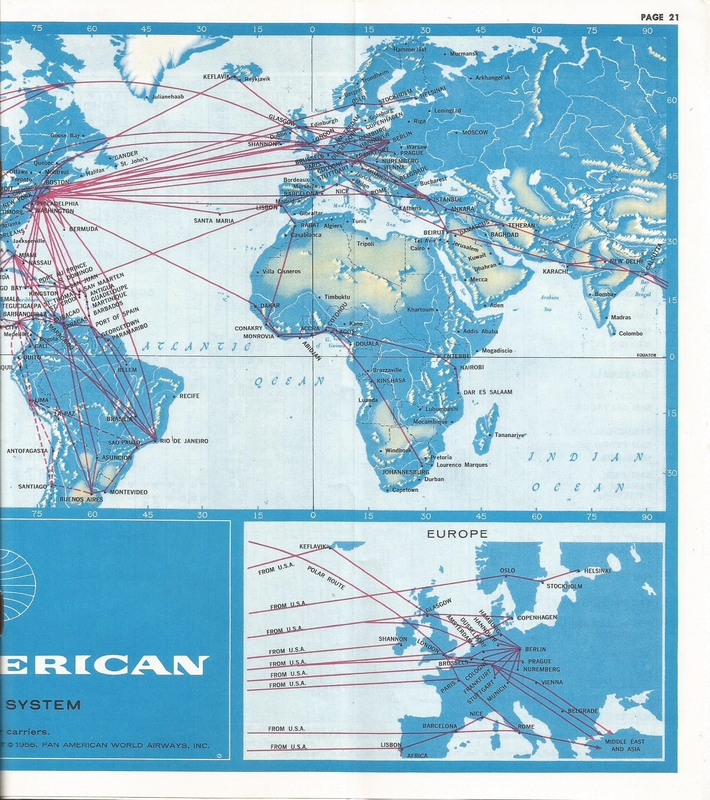 A small handful U.S. carriers operated international routes, most notably Pan American, TWA and Northwest, with Pan American being the dominant carrier and considered the “Chosen Instrument” for the United States. On 15 October 1966, the United States Department of Transportation (USDOT or DOT) was established as the federal Cabinet department of the U.S. government concerned with transportation. It began operation on April 1, 1967 and is headed by the United States Secretary of Transportation. Prior to its establishment, the Under Secretary of Commerce for Transportation administered the functions now associated with it. In 1965, Najeeb Halaby, then Administrator of the FAA, suggested to President Lyndon B. Johnson that transportation be elevated to a cabinet-level post, and that the FAA be folded into the DOT. The FAA became an agency within the department. The CAB remained an independent regulatory agency with jurisdiction over economic matters (routes and rates/tariffs). Established the National Transportation Safety Board (NTSB) that took over the CAB’s accident investigatory function. NTSB was severed from DOT by the Independent Safety Board Act of 1974. In the international arena, the foreign flagged airlines in the Post War era were largely state-owned and were controlled by their respective civil aviation authorities. International routes were governed by bilateral agreements between the countries involved and fares were agreed to at Traffic Conferences organized by IATA. The airline of the Soviet Union, Aeroflot, and airlines of Eastern European countries were also state-owned. Foreign-flag carriers operating international routes were generally identified as being the “Chosen Instrument” of their owning countries. One very important factor during this era was the government role in international civil aviation, best illustrated by how governments dealt with aviation issues in three main areas: ICAO, IATA and bilateral Air Services Agreements (ASA). This era was dominated by the Cold War, and the international airline industry was in many respects, though not obviously, a pawn in the struggle between the super powers at the time. Political considerations became apparent early, when, in 1947, ICAO became an agency of the United Nations. In one case, as a condition of acceptance of ICAO into the UN, the Soviet Union demanded the expulsion of Spain from ICAO. Spain was then considered a key terminal and a source or destination for a substantial amount of traffic, and its expulsion hampered the development of air facilities and aids to navigation that were essential to orderly air transport. In another case involving South Africa, thirty-one African nations demanded the expulsion of that country because of its apartheid policy. The attempt failed because of failure to meet the required advance notice. Government involvement in IATA activities, although a non-governmental organization, was also prevalent. Under its Articles of Association, traffic or rate conferences were called whenever necessary. Each member had one vote, and each member had veto rights. These conferences made a variety of decisions, but only those that were unanimously agreed on and expressed in the form of a resolution were binding. However, because most international airlines at the time were state-owned, these resolutions would not be binding on the international airline until its government approved. Further, a member would not be bound if it certified the resolution was not coincident with the laws or official policy of its government. Despite these restrictions, however, government approval of IATA resolutions during this period was overwhelming. This can be attributed to the fact that most international airlines received instructions prior to attending the conferences and in some cases, airline representatives were actually state or government employees disguised as officials of the state-owned airline. The government role in the industry, however, was most intense and interesting at the bilateral level. This was particularly true during the Cold War and the role of government was interpreted in terms of foreign policy. The international airline could either be an instrument of foreign policy or it could reflect or parallel the foreign policy of a country. A country may also use its international airline to gain political favors from other countries. Here, the key to successful negotiations was bargaining power, or the ability to influence other countries in a way that would contribute to the economic success of the home country’s airline. It was also entirely possible that an airline’s profitability could be damaged because something of value to a national airline could be traded away by government to meet a governmental objective. For the most part the countries of the international airlines exchanged routes on a reciprocal basis and when both had equal bargaining power. A country with greater power, however, can demand more for its routes. In a 1957 case, KLM Royal Dutch Airlines applied for additional routes in the United States. The U.S. government was not prepared to grant these additional routes because the Netherlands had nothing to offer in return. To the Dutch, KLM was one of the Netherlands’ biggest industries that was a symbol of Dutch internationalism and initiative. Thus, to obtain the desired routes, the Dutch offered a continuing cooperation with the North Atlantic Treaty Organization (NATO). This was acceptable to the US and the routes were granted. The granting of airline rights to foreign governments in exchange for political support, military bases or troop contributions to NATO were regular bargaining tools of the U.S. in order to maintain its military superiority over the Soviet Union. ASAs can also be subject to disputes between the parties and at times an injured party might resort to counter-measures to protect its interests. 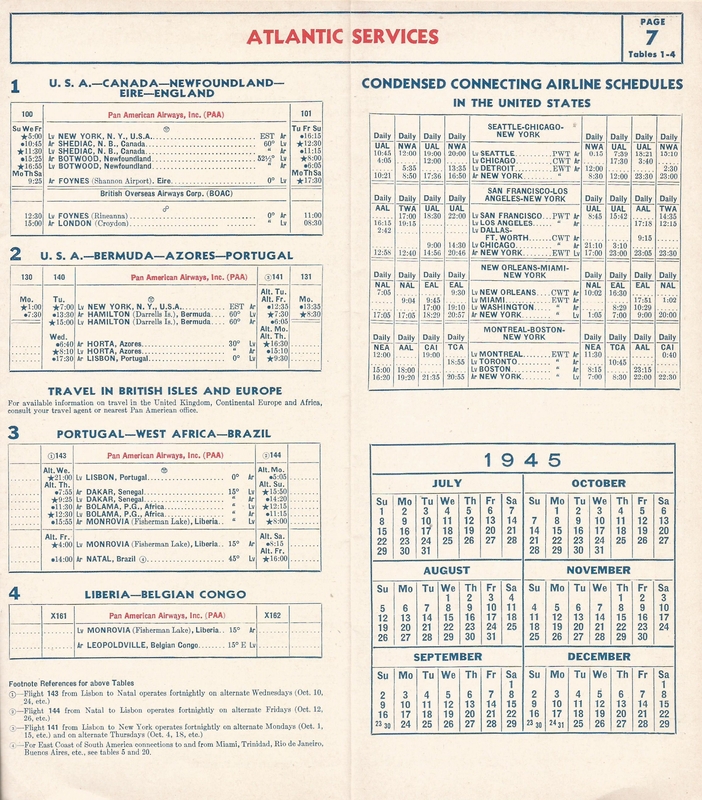 This was illustrated in a case between Pan American and Air France in connection with the bilateral ASA between the U.S. and France. Under that agreement Pan American was authorized a scheduled service between Paris and London. However, because of the aggressive subsidies being provided by the French government to Air France, Pan American decided to substitute a smaller, more economical aircraft for the 747 already scheduled on that route (gauge change). The French government refused on the basis ranging from assertions of national honor (Pan American flying anything smaller than a 747 into Paris would be an affront) to the more pragmatic reason that Air France would enjoy the prospect of forcing its competitor to run a grossly unprofitable route (with the 747). Finally, the French compelled Pan American to cease its flights to Paris. The U.S. government proposed arbitration to resolve the dispute, but for two years the French refused. The U.S. eventually made a reprisal by suspending Air France’s Paris-Los Angeles route, long established under the ASA. This got the French government’s attention and France agreed to arbitration. 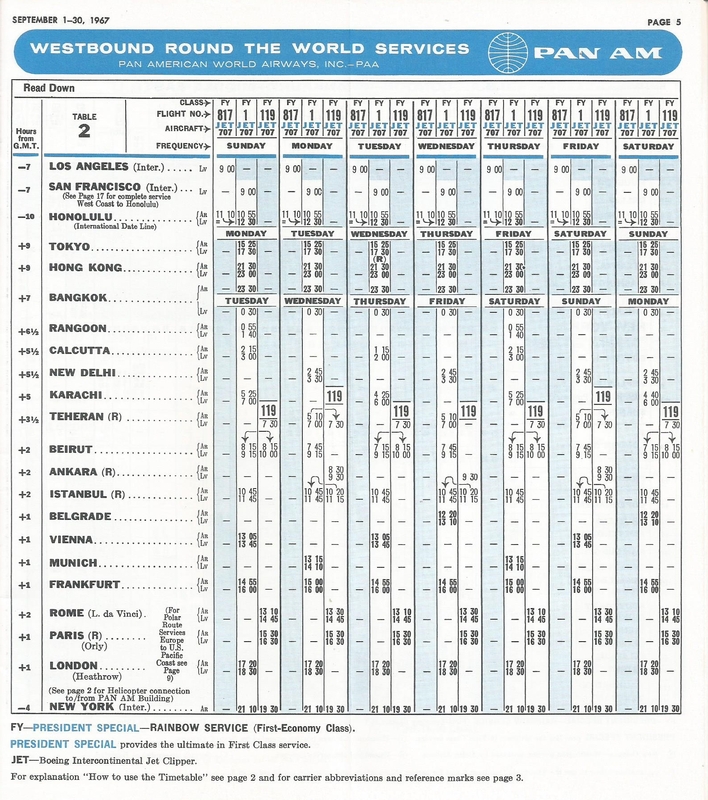 The issues were (1) whether Pan American could change gauge and (2) whether the U.S. could unilaterally suspend Air France’s route to Los Angeles. The first issue was resolved in favor of Pan American. In the case of the second issue, the French argued that as the ASA provided for arbitration, it was impermissible for the U.S. to engage in unilateral self-help measures. The arbitrator ruled, however, that it was France that had been setting up barriers by not agreeing to arbitration and that it was only the U.S.’s retaliatory move terminating the Los Angeles route that brought France to the table. In short, the arbitrator ruled that counter-measures were a necessary part of the punch and counter-punch often needed to get parties to submit their disputes to arbitration or other method of binding settlement. One point made in this case was that in any use of counter-measures, there could always be a risk of escalation. France could have cut off Pan American’s New York-Paris route and then the U.S. could have retaliated by economic or other sanctions outside the air transport sector, and so on. The point here is that although the underlying reasons for the dispute were aviation related, there could have been other non-aviation factors driving the actions of the French government. Beyond the government role in ASAs, and as alluded to above, an international airline during this era could be a reflection of or parallel the foreign policy of its country. A good example of this is Aeroflot, then the only international airline of the Soviet Union. As previously mentioned the Soviet Union did not attend the Chicago Convention. The Soviet policy at the time was that of isolationism and civil aviation was kept at a low priority. This changed in the 1950s when the Soviet government switched to a more internationalist policy in relation to the Eastern Bloc countries, and it was reflected in Aeroflot’s opening of new routes to capitals in Eastern Europe. The 1960s also witnessed some dramatic changes after the switch from the Khrushchev regime to the Brezhnev-Kosygin regime. Here the policy changed to greater flexibility toward the Western powers, and Aeroflot began operating to countries outside the Soviet bloc and by 1967 almost all Western European capitals. In 1968, after several years of negotiations, service was inaugurated between the U.S. and the Soviet Union. The agreement best illustrates the concepts of political considerations in bilateral negotiations and the notion of the “Chosen Instrument”. The airlines involved were Pan American and Aeroflot. 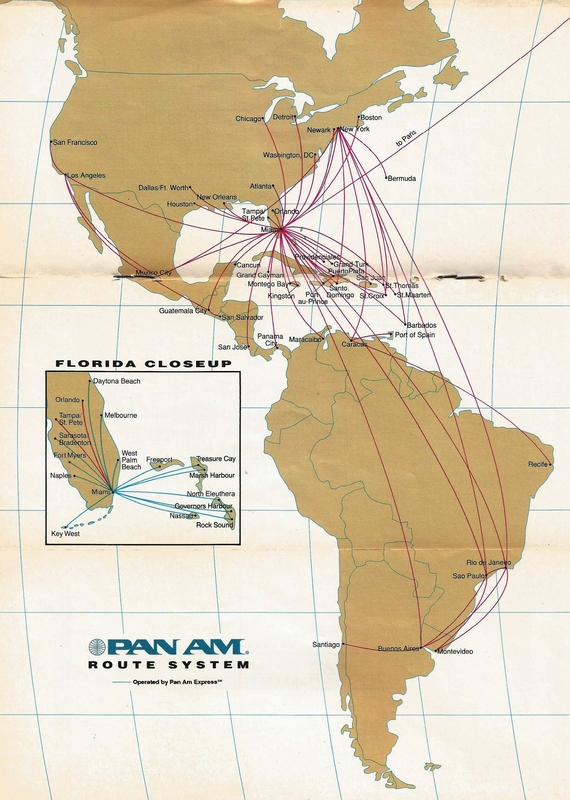 If there was any route in Pan American’s history that could be designated as a “Chosen Instrument” route, the U.S.-U.S.S.R. could be that route. Pan American was the selected airline because it was recognized as the primary U.S.-flag carrier as manifested by the So viet Union’s aviation officials making the initial contact directly with Juan Trippe. After reporting the contact to the U.S. State Department and the Civil Aeronautics Board, Trippe was authorized to negotiate with the Soviets on key issues for an ASA between the two countries. However, given the political climate, it can be reasonably inferred that political considerations also played a role in formulation of the final agreement between the two countries and both Pan American and Aeroflot were instruments of those considerations, and therefore instruments of both countries’ foreign policy, hence, “Chosen Instruments”. 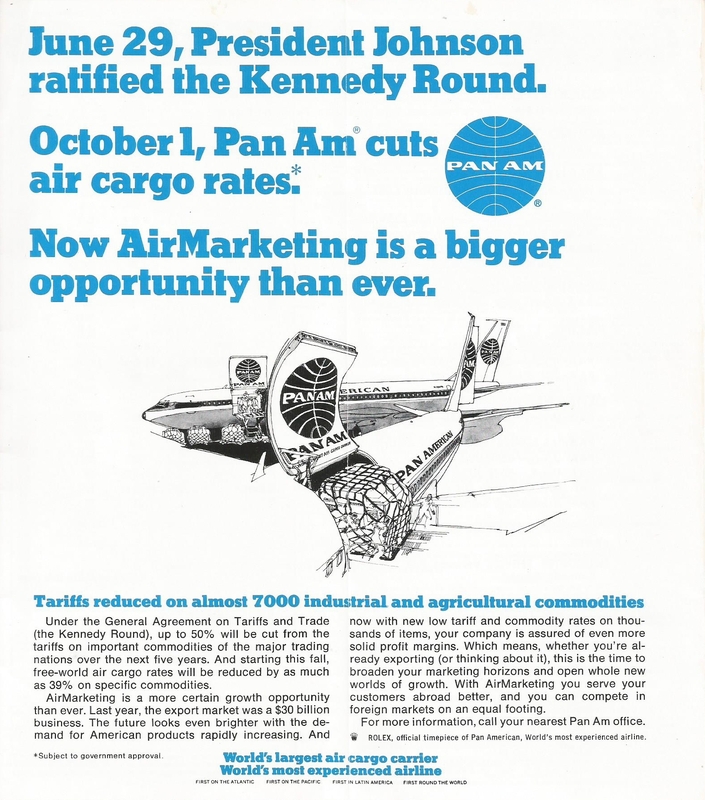 For Pan American, a private enterprise as opposed to the state-owned Aeroflot, the operation was a money loser and the competition was not on a level playing field. 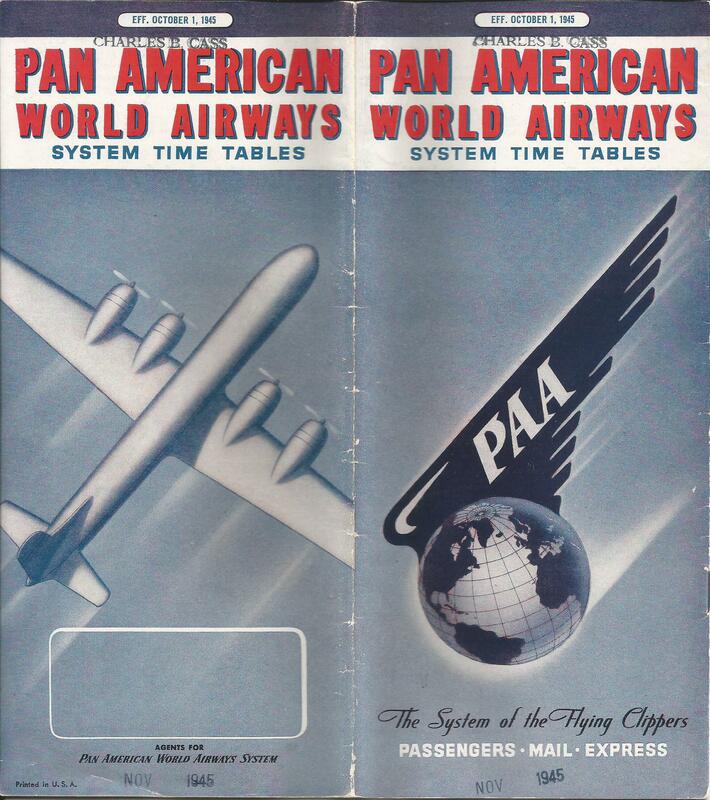 Quite simply, Pan American could not sell tickets in the Soviet Union and was at a tremendous economic disadvantage. Unfortunately, there was no provision for a subsidy to a U.S. flag carrier operating at an economic disadvantage in an international market at the government’s bidding. Pan American eventually suspended the losing operation but did so when U.S.-Soviet relations were souring. It was not until relations began to improve between the two countries in the mid to late 1980s did the service resume, in 1986, later crowned with a non-stop 747 service in 1988. From the late 1960s through the early 1970s, Aeroflot grew rapidly and by 1973, had set a record for route expansion, operating under sixty-five bilateral agreements with other countries. These changes from isolation to a world-wide presence could be considered a reflection of the Soviet Union’s foreign policy at the time, or it could have been viewed as a challenge to the U.S. superiority in air transport. Whatever the case, the Soviet policy of détente was based on political and economic weakness. There were three basic reasons for this: (1) the Sino-Soviet Conflict, in which China had survived the Cultural Revolution and gained strength in the international arena; (2) the avoidance of Western European unity, which could be a strategic threat and a threat in itself to Eastern Europe and the Soviet control of Eastern Europe; and (3) the weakened Soviet economy, which had found the Soviets lagging behind the U.S., especially in consumer goods. The policy was designed to effect technological cooperation with the West, avoid a political struggle on two fronts (China at one end, the West at the other) and increase political influence in Europe. In 1973, Aeroflot concluded a Trans-Siberian route exchange (connecting Europe and Japan through Moscow, thereby saving time and mileage) with Japan Airlines, British Airways, Lufthansa and Air France. The Trans-Siberian route was considered important because it impacted the bargaining power of both the U.S., where travel between Japan and Europe was through Anchorage, Alaska, and the Middle East, which had bargaining power with Fifth Freedom rights. By granting this route to Japan Airlines and the European airlines, the Soviet Union effectively diminished the U.S. and Middle East bargaining power in this market. In addition, this Soviet move made possible increased influence in both Japan and Western Europe. Whether the Soviet activities at the time were a threat to U.S. leadership is questionable. First, the Soviet aircraft were well behind those of the U.S. technologically and were more expensive to operate; secondly, the airline service offered was not consumer-oriented and was reputed to be deplorable; and third, Aeroflot was not a member of IATA at the time. However, the view at the time was that the rapid Soviet growth was a bid to engage in a contest for national prestige and political influence, by using aviation as a means to an end. The next installment of this story, Part 5, will cover Deregulation and Open Skies. On 14 January 2015, former Pan American captain Gerry Mahan celebrated his 100th birthday. 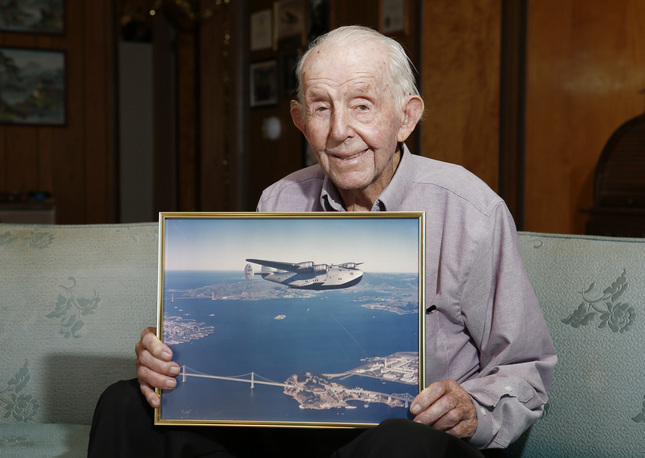 Captain Bill Nash, whose story about flying the Boeing 314 was featured in Part II of this series, is in his late 90s. Both men started with Pan American near the beginning of World War II and stayed with the airline until into the 1970s. Both got their feet wet with Pan American as pilots in the Boeing 314, the last of the great flying boats. There were others who flew these great machines that also included the Sikorsky S-38, S-40 and S-42, the Consolidated Commodore and the Martin M-130: R.O.D. Sullivan, Leo Terletsky, Steve Bancroft. Ed Schultz, Bob Ford, who flew the first round-the-world flight in a commercial airliner and Edwin Musick, probably the most famous of the flying boat pilots, who flew the first trans-Pacific scheduled airmail flight in the China Clipper. These men were known as “Skygods” and today they are few and far between. “Born in Kansas on Jan. 14, 1915, Mahan was raised by his grandmother until he ran away at the age of 13 — about a year after Charles Lindbergh gained international fame for completing the first solo flight from New York to Paris. “‘The freight trains were running in my direction,’ Mahan joked. “He settled in Southern California and lived with his aunt. He sold shoes to put himself through UCLA. By age 18, he owned his first plane, his daughter, Luana Davis, 72, said. He flew for TWA before joining Pan Am in 1941. 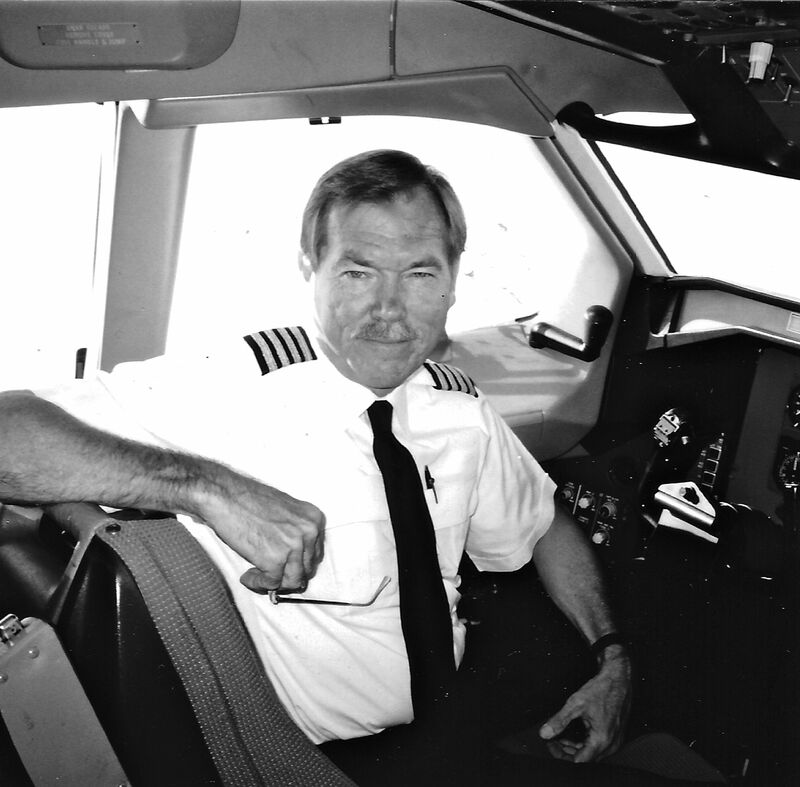 He flew everything from DC-3s to 747s, retiring out of San Francisco in the mid-1970s. He taught his oldest daughter, Luana, how to fly when she was just 11. She spent her career flying for Federal Express. Captain Nash flew flying boats in support of the war effort during World War II and at war’s end, when Pan Am phased out the flying boats, he progressed to the DC-3s, the DC-4s, the Constellations, the DC-6s and the DC-7s. Eventually he was flying jets, and during his last fifteen years with Pan American, he was based in Berlin, flying Pan American’s Internal German Services, and, “keeping the corridors to Berlin Open”. Nash retired in 1977. 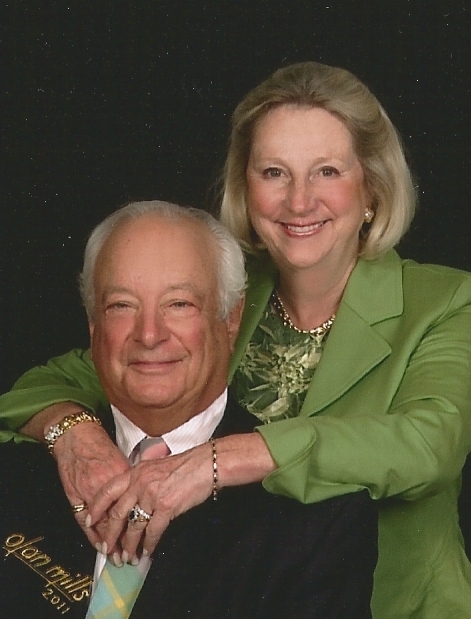 One son, Bill Nash, Jr., is also a pilot. “Never mind that this was 1965, that Pan Am possessed the largest fleet of commercial jets in the world, or that futuristic craft like the 747, the SST, and even spacecraft were on the drawing board. 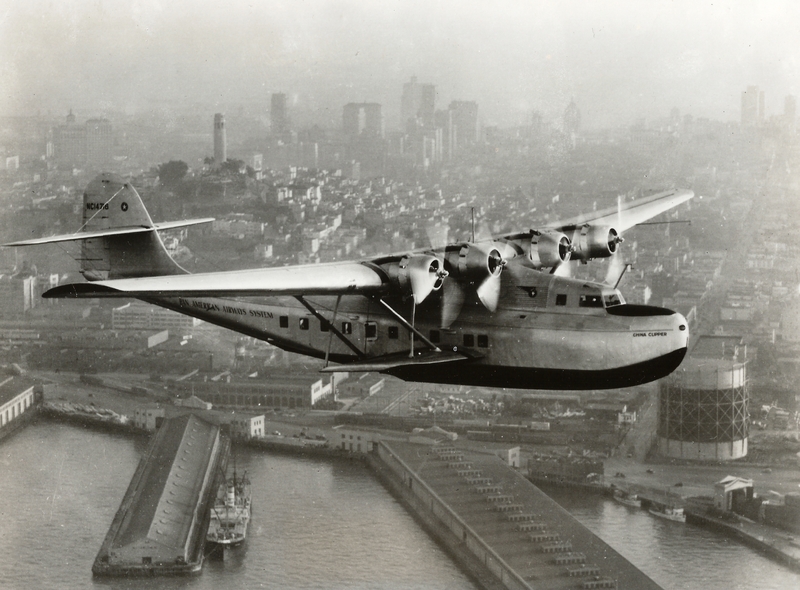 The Boat Days—the era of the great flying boats like [the S-42], the China Clipper and the majestic Boeing B-314—were the spiritual epicenter of Pan Am’s history. And the high priests of the Boat Days were a generation of legendary airmen we called Skygods. “And they were still around. We caught glimpses of them in the big blue Pan Am hangar at the San Francisco airport where we attended classes. Like living artifacts from another age, the lordly airmen could be observed striding down the hallway to attend to their worldly business in the crew scheduling or personnel offices. Their heels clacked like hammers on the marble floor. “Even their uniforms were distinctive. The gold on their cap visors and the four stripes on their uniform sleeves had a weathered, salt sprayed dullness. The white caps rode atop their graying manes with a windward tilt. In their double-breasted, gold-encrusted Pan Am uniforms they looked like ancient mariners. “Their trademark was the Look. Skygods squinted at the world over the tops of half-frame spectacles, down the lengths of their leathery noses. Wearing the Look, they would lock their imperious gaze on whatever subspecies happened to warrant their attention. “Not until a year-and-a-half later, when I was a freshly-qualified Boeing 707 first officer, did I actually fly with one of these legendary captains. He was a Skygod of monumental reputation, a man whom I’ll call Jim Howland, and we were scheduled to operate a Pan Am round-the-world flight. The experience would stay seared in my memory for the rest of my career. “So it went for the next few days —the Skygod issuing commands, the lowly first officer complying. It was impossible to tell whether Howland was pleased or disgusted with my performance. His expression never changed. Nor did the monosyllabic stream of orders. He made every take off and landing, sharing none of the flying duties with his first officer. “Intentions? I looked at the captain. He appeared to be deep in thought, his eyes fixed on the hazy brown desert-scape ahead of us. The controller sounded flustered, and so did the Pan Am operations agent on the ground in Beirut. No one knew what was going on or where we should go. The controller offered the opinion that since Beirut airport didn’t seem to be under attack at the moment, it was probably safe to land. Probably. “Tehran? Ooookay. The Skygod had spoken, and it didn’t matter what air traffic control or our man in Beirut had to say. Clipper One was headed for Tehran. The problem was, getting a clearance to there—or anywhere else—wasn’t possible. The en- route frequency had become a bedlam of hysterical chatter about airports being bombed, fighters in the air, warning shots fired. “Off we went, eastward over the desert, while the relief pilot and I re-calculated our fuel and pored over the charts and tried to get clearance through the airspace. We encountered no fighters, no one tried to shoot us down, and somewhere along the way I actually obtained an airways clearance. When we landed in Teheran and deplaned our 120 passengers, we learned that we had just experienced Day One of what would be the Six Day Arab-Israeli War of 1967 . “I was speechless. You did good today. Coming from a Skygod, it was like an accolade from the Almighty. “Thereafter, for the remainder of our trip around the planet, Howland actually shared the take offs and landings. And he talked. In quiet moments high over the ocean, he recalled adventures from the Boat Days when ships like the China Clipper ruled the skies. They were exotic stories, and it didn’t matter to me that they might be a bit embellished. I listened like a kid hearing fairy tales. “Over the next couple of years I flew with more of these ancient pelicans, and while the experience was seldom heartwarming, I always had the sense of being connected to a slice of history. The era of the Skygods spanned a time from fabric-and-wood mail planes, through the glamour-filled Boat Days, through WWII and the arrival of long-range landplanes, all the way to the jet age. They had seen it all. In his book Skygods – The Fall of Pan Am, Gandt recalls how the newly hired pilots would watch the Skygods with awe. “Like everything else”, he said, “they knew these ancients had practically invented aviation. Back in the boat days, these heroes had braved a thousand storms, alighted on mountainous seascapes, flown over the vastness of great oceans.” They were the Masters of the Ocean Flying Boats. They also played a part in setting the operational standards that governed Pan American’s pilots in the Jet Age. The standards set by Priester and the Skygods he trained transcended to the generations of Pan American pilots who followed. The pilots who were hired in the mid-1960s, who were known as the “New Hires”, a name that stuck with them throughout their careers, helped bring the art of piloting to the highest levels. To the current generation of airline pilots, they are the Skygods of today. Robert Gandt (above left), a former Pan Am captain, was based in San Francisco, Berlin, Hong Kong, and New York during his twenty-six-year career. He is a novelist, historian, and the author of thirteen books. 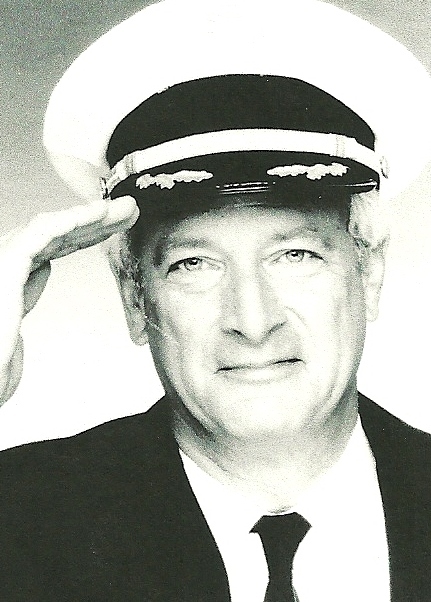 In 2011 he received the Samuel Ellliot Morison Award for Naval Literature by the New York Commandery of the Naval Order of the United States. 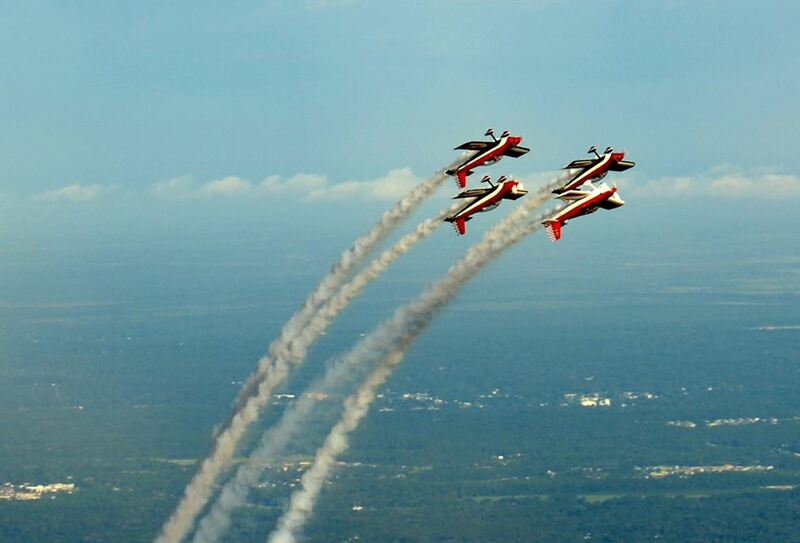 Still flying today, he is a member of the Redhawks Aerobatic Team (above right). Visit his website at www.Gandt.com. Twenty-six years ago today Pan American World Airways flight 103 was destroyed by a terrorist act over Lockerbie, Scotland. The story was posted in the Pan Am Series last year on the 25th anniversary. It is re-posted today with additional material toward the end of the posting. “At one time, I subscribed to Aviation Quarterly, which was remarkable in its quality, its appreciation of aviation, and its unrelenting pursuit of excellence. It was hardbound and worthy of being perused in my favorite lounge chair as I enjoyed a snifter of choice brandy. I was a life-time charter member, but it is now defunct and belongs to history. Nothing is forever! “My airline now belongs to the past as surely does my aging lot of forgotten magazines. 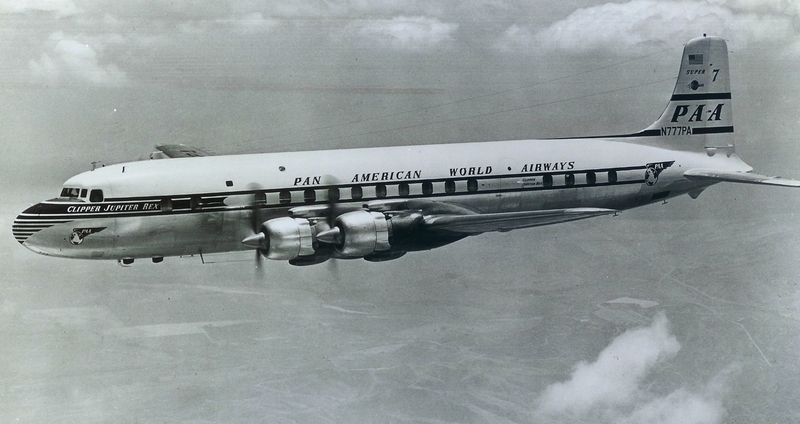 Pan American World Airways is lost–lost to corporate ineptitude, governmental indifference, and an inability to change with the world it helped to bring together. “’It looks like a beautiful day to go flying,’ First Officer Robert Knox of Greensboro, N.C., said as we began our ritual of checking the weather along our route of flight. Flight 219, bound for Bridgetowne, Barbados, was one hour from departure. We completed the paperwork that would ensure that the trip would meet all legal requirements for performance and weight and balance. We were more than businesslike, because CNN had reported the night before that Delta Air Lines had withdrawn its support for our newly proposed company. “On most occasions, we would have made a comment or two about sports or hobbies at a predeparture briefing. Individuals who had not flown together before would use such small talk to break the ice of unfamiliarity. This morning was certainly different–an air of finality hung about everyone at our counter. The fact that it was 6 a.m. further depressed the atmosphere. The engineer, Chuck Foreman of Washington, D.C., was poring over the fuel figures. He had just returned to the Boeing 727 from its much larger cousin, the jumbo Boeing 747. “We walked briskly to our aircraft, ship No. 368, one of the newest Boeing 727s in the fleet and quite a pleasure to fly with its more powerful engines and spirited performance. 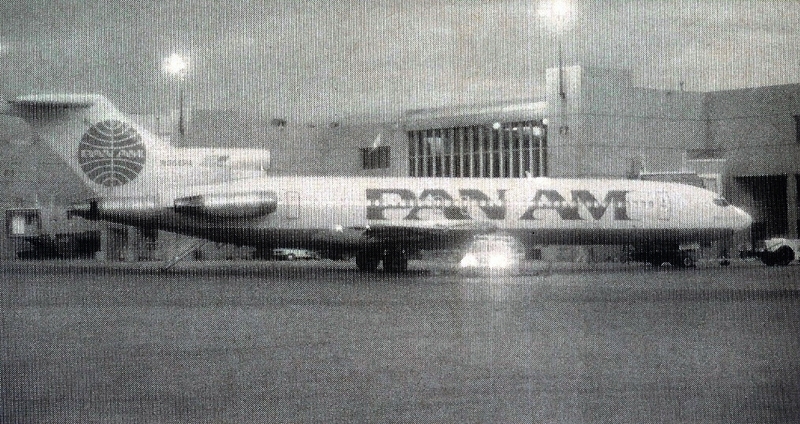 Pan Am had many Boeing 727s, but most were older. Their engines were always adequate but would not produce the kick in the seat of this newer model. I stowed my gear in the cockpit with a feeling of quiet pride, generated by command of such a machine. I then walked aft to greet the flight attendants who would complete our ship’s company on this beautiful New York morning. “Immediately, the purser raised the question of Delta’s withdrawal, and my answer was the same as it would be to my cockpit crew members: ‘Whatever the day holds, we will make it a good trip.’ All agreed that it would be, whether as the first of many, as the promised ‘born again’ Pan Am with roots in Miami, or as the last of many. “As we gathered speed, I marveled at what fine engines the wonderful folks at Pratt and Whitney had provided for us. Gently, I eased the nose of this beautiful airplane skyward. The sound of rushing wind and whirring instruments added to what is always a magic moment in every pilot’s life. The ground fell rapidly away, and the sky above beckoned. Both man and machine were happy to oblige. We turned away from the familiar Manhattan skyline and pointed the nose of Clipper Goodwill south–toward Barbados. “We flew over Bermuda, that incredible 21-square-mile piece of volcanic rock, where I had spent my last Christmas on layover. I have many happy memories of Bermuda and of other places–all associated with destinations on what had been a world carrier. Tokyo, Seoul, Bangkok, Manila, Beijing, Berlin, Frankfurt, London, Venice, Oslo, Istanbul, and many other cities–destinations previous Pan Am employees largely pioneered–all hold memories for many more Pan Am employees. “The station manager approached as he always did and greeted the inbound passengers. He then stepped into our office (the cockpit) and greeted us cordially, explaining he had some bad news. I quickly responded that I thought we could guess the nature of his grim tidings. He produced a message from New York operations in a very familiar format. This content, however, had never before in its 64-year history been inscribed on any Pan American document. 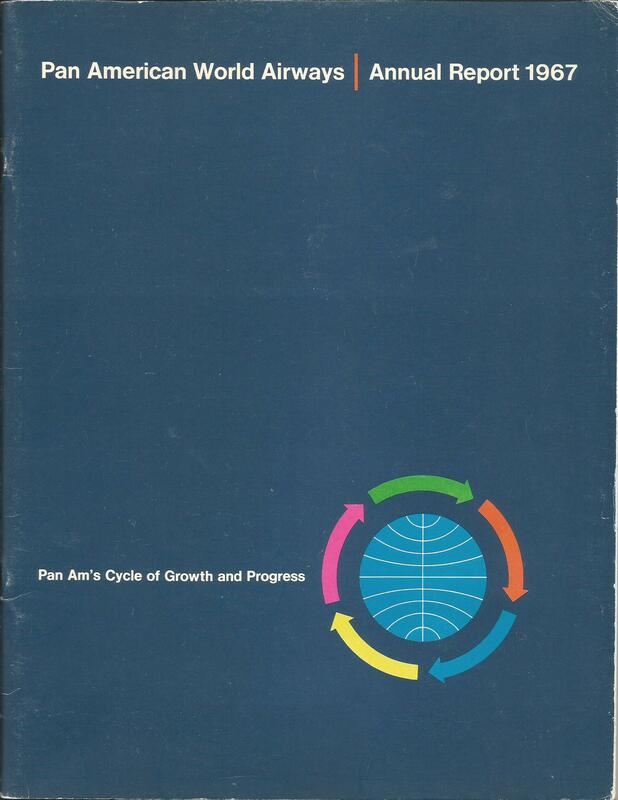 Pan Am, as of 9 a.m. on Dec. 4, 1991, had ceased operations. None of our flight attendants could restrain their emotions, or their tears. All were at least 20-year veterans with Pan American or National Airlines. They vented their disbelief and their resentment of the Delta decision; consoling them prevented those of us in the cockpit from showing our own pent-up feelings. “Our station manager asked us if we would operate the trip to Miami. He would find a way to buy fuel. Many passengers were stranded, and some Pan Am employees were packing to leave their stations and their jobs. We informed our station manager that we would delay as long as possible. This would ensure that all those wishing to return to Miami had time to board. We waited more than two hours in mostly silent thought while the passengers gathered from their hotels and employees packed their belongings. “At one point, the local airport employees who had served Pan Am so well, and whom Pan Am had so well served, came to the aircraft. A tearful ceremony followed. Flowers and good wishes were exchanged. The local television news media requested interviews. Airport employees barraged the Clipper Goodwill for last pictures, which would adorn family scrapbooks. “At 2 p.m. EST, the wheels came up on Clipper 436, hailing from Bridgetowne, Barbados, and bound for the city of Pan Am’s birth. We flew with silent thought, exchanging few words as time passed. San Juan Center cleared our flight direct to Miami, and I punched in the navigational coordinates for Miami International a final time. Little could be said in the face of a solemn reality–the certain knowledge of dead-end careers. What happened can best be described as a death in our immediate family. Pan American was my family in every sense. It was the corporate family to thousands. The engineer spoke again in my direction very softly, so softly I could not understand. I said, ‘You’re kidding, right? They’re joking!’ Privately, I thought it might be a friend who had landed before me, now pulling my leg. “Miami lay before us. A cold front had just passed, and fog followed the coastline, extending out to sea almost to the Bahamas. Miami sat on the other side of the fog bank, eerie and beautiful at the same time. Dinner Key lay nestled in the fog. My mind raced at the finality of what I was doing. This wasn’t just the end of my career! This airline’s fading into history far surpassed the end of any individual’s career. Franklin Roosevelt had left from that same Dinner Key aboard Dixie Clipper, bound for Casablanca in 1943, the first American President to fly while in office. “Pan Am had not been just a part of history, it had made history for all of its 64 years. It was always there when the government needed it. 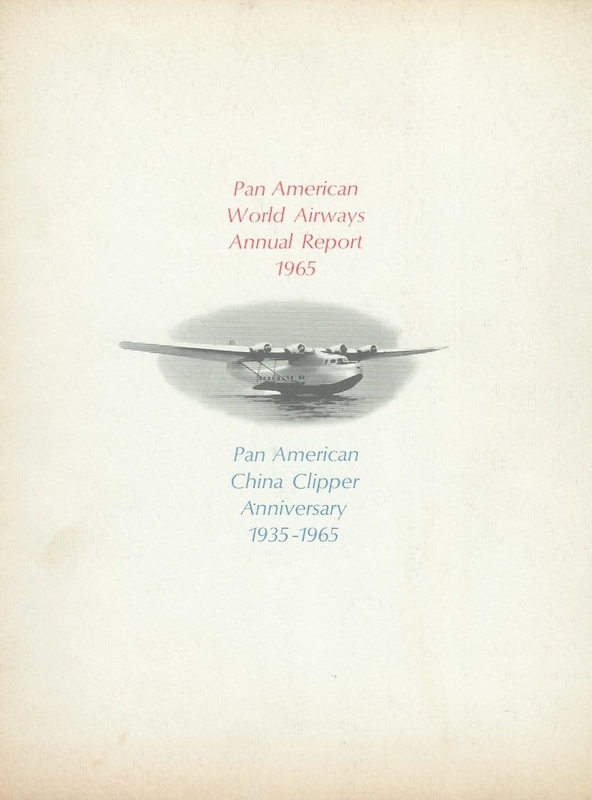 Indeed, Pan American Clippers had many scars as mementos from encounters with enemies of the United States. From Japanese bullet holes a lumbering clipper received as it evacuated key military personnel from Wake Island during the early stages of World War II, to the terrorist bombing of “Clipper 103.” More recently Pan Am pilots and airplanes aided in Operation Desert Storm. A Pan American Clipper brought me home from Vietnam. 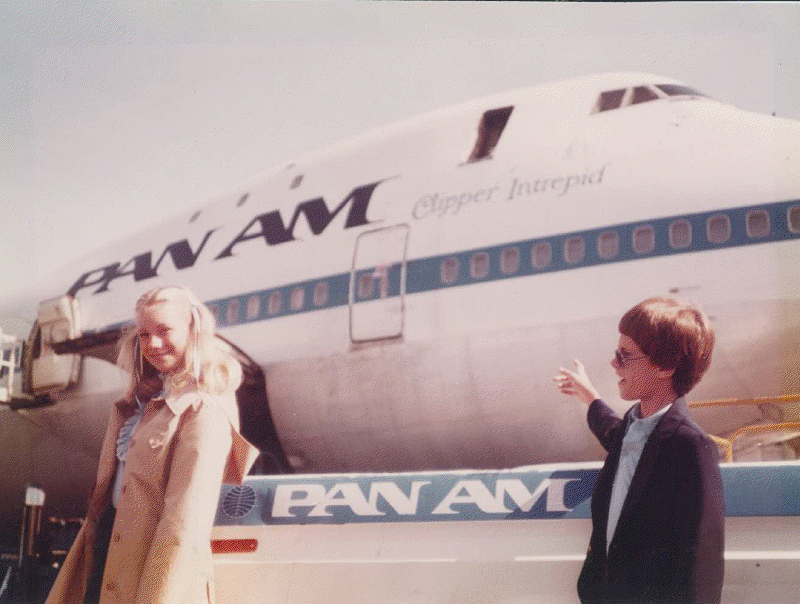 Now Pan Am had only Clipper Goodwill and this last crew–this final flight. “Pulling up and turning downwind for our final approach and landing, I looked at the beautiful Miami Airport and the city it serves. We all realized this would be the last time. Again, the finality of the moment slammed my senses. Our wheels touched for the last time in a Pan American aircraft –the last time for a scheduled revenue flight of any kind for this historic airline. “As we taxied past the first formations, men and women came to brisk attention and saluted ‘the last of the Clippers.’ Tears welled up in my eyes then for the first time. Many rows of people and machines–all smartly formed–all saluted. I returned the salute just as crisply, fully knowing that their salutes were to this “machine” and to all the ‘machines’ that bore the title ‘Clipper’ for 64 years. Their salute was to the history that this ship represented and to all that had gone before. “We passed the line of fire equipment, and the water cannon was fired over the aircraft. My emotions reeled under the weight of this tribute to Pan Am’s last flight. I engaged the windshield wiper to clear water that was on the windscreen, but that did little good for the water in my eyes. My first officer fought back his tears. He had worn Pan Am blue for 23 years. “One final formation–all Pan American ground personnel–tendered their last salute. We approached the gate and set the brakes for the last time. We shut down systems for the last time and secured the faithful engines. Sadly gathering our belongings, we shook hands. Our final fight was over. No eyes in the cockpit were dry. Many of the departing passengers shared our moment of grief. The tears for Pan Am will continue. Out of this came the Boeing 720. As described in its website, while the 707-100 series was being introduced and the long-range 707-300 series was being planned, Boeing also decided to develop a 707 derivative with increased performance for short-to-medium range routes, allowing the plane to operate from shorter runways. Initially the plane was identified as the 707-020, was later changed to 717-020 and, with input from launch customer United Airlines, was eventually designated the 720. Outwardly the model 720 resembled the 707, but it was a very different airplane. It had a much lighter structure and was 9 feet (2.74 meters) shorter than the 707-100. It also had an increased wing sweep on the leading edge between the fuselage and inboard engines as well as full-span Krueger leading edge flaps. The 720 carried less fuel than the 707-100. Combined with its lighter structure, this gave the plane a lower gross weight, increased takeoff performance and a higher top speed. The 720 went into service on 5 July 1960 with United Airlines. Boeing built 65 model 720s. The only variant of the 720 was the 720B which first flew on 6 October 1960. The main difference on the 720B was the installation of Pratt and Whitney JT3D Turbofan engines that increased the takeoff and climb performance as well as cruise speed of the plane. These engines also increased the range to 4000 miles, which, for a short time, was the longest range for any commercial airliner. Boeing built a total of 89 720Bs. 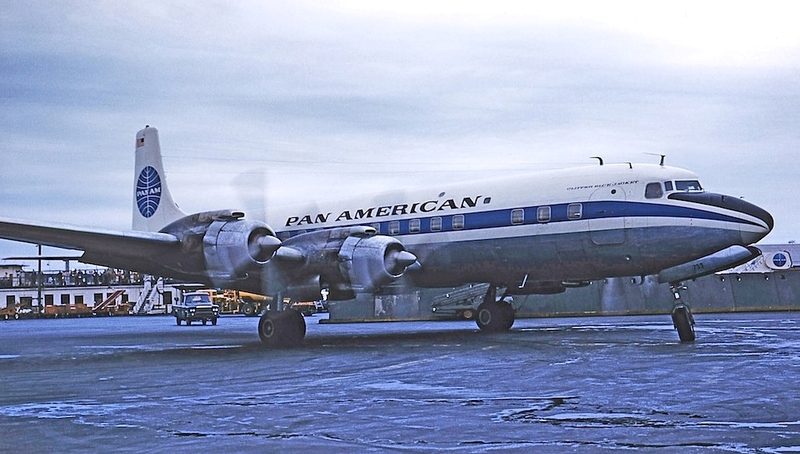 Pan American operated nine 720Bs, delivered between 1963 and 1965. They were mainly used in the Caribbean and Latin America and were eventually disposed of by 1974. The 720 proved to be an economical plane to operate and was a favorite of pilots, passengers and operators alike. However, the rapid pace of technology soon caught up with it as the more capable 727 replaced the 720 as the leader in the medium-range, high-performance market. 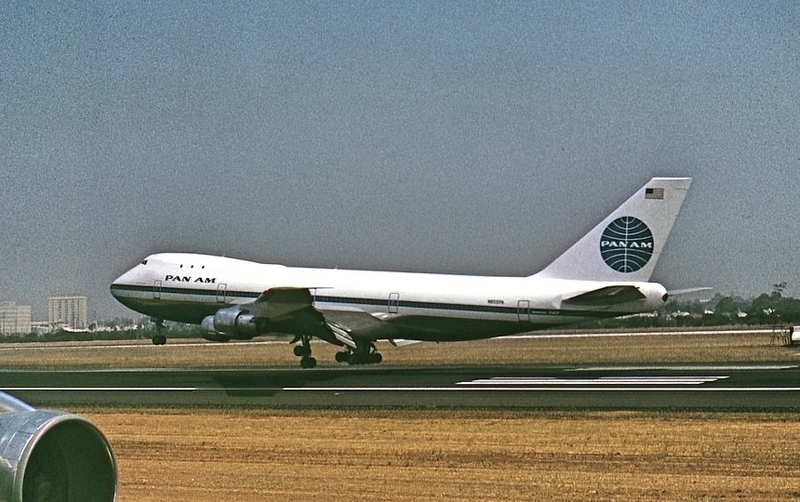 In his seminal book, Pan Am – An Airline and Its Aircraft, Ron Davies referred to the Boeing 707-320 Series as “one for the great airliners of all time”. While this airliner may have later been overshadowed by her bigger and more powerful sisters, this statement remains true. 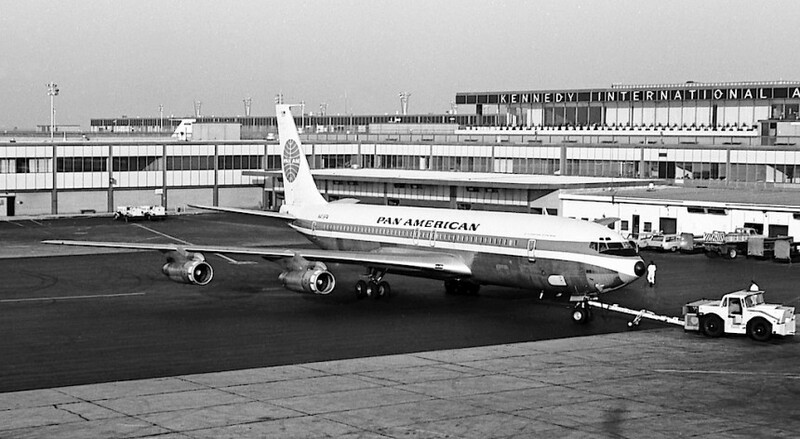 Pan American began taking deliveries of the Boeing 707-321 (-321 indicated Pan American service) in 1959. 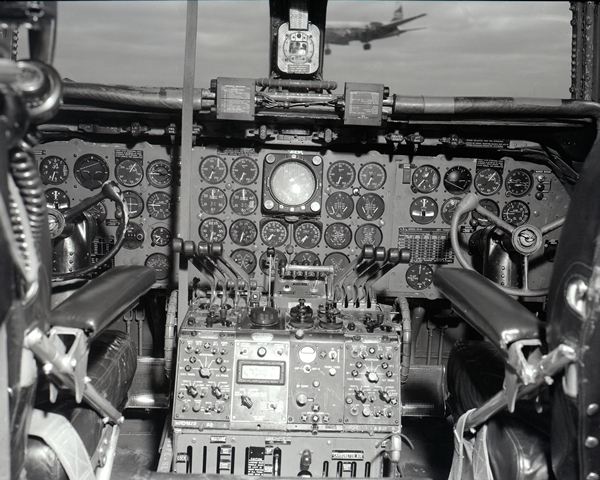 However, the impact of the aircraft was really felt during the following decade. 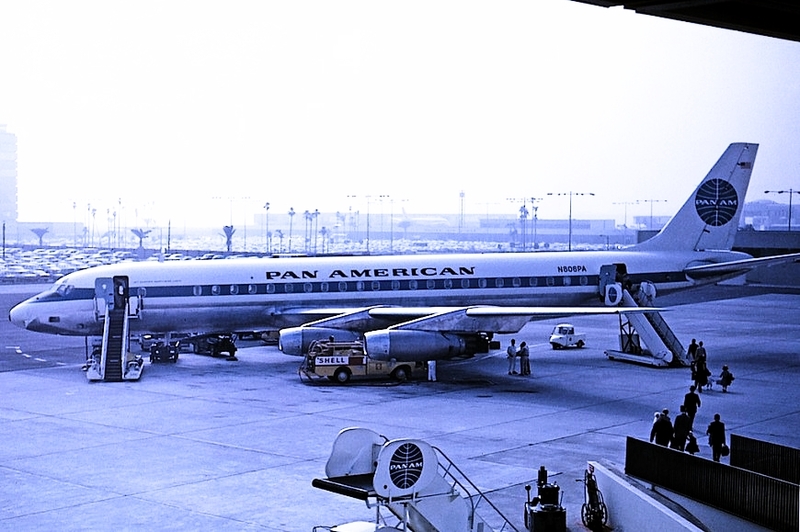 The 1960s, in particular the years 1963-1968, represented the pinnacle of Pan American’s success. Pan American dominated the international airline arena like no other airline during that decade, a period when the volume of air traffic quadrupled. During that time, Pan American could do no wrong. By the middle of 1962, it was the first airline to complete 100,000 transatlantic flights, a figure, according to Davies, “not even approached by any other airline at that time”. On 7 March 1963, Pan American moved into a new building that towered over Grand Central Station in New York City, with the “Pan Am” abbreviation in huge letters on the top, visible for miles up and down Park Avenue. As Robert Daley said, in An American Saga, “The once tiny airline had become the world’s biggest and most famous”. In the airline’s 1965 Annual Report, it was announced the retirement from regular service the last of its piston fleet, making Pan American an “all-jet airline”. The 1967 Annual Report, which, by some accounts, detailed Pan American’s most successful year in its history, highlighted the delivery of 32 jet aircraft in 1967 with an additional 31 “present generation jets” on order for delivery in 1968-69 and announced airline’s $600,000,000 order for 25 Boeing 747 “Superjets”, and in doing so, “led the industry to a new generation of heavy duty transports”. It was also announced that “Pan Am will be the first American-flag airline to operate [Anglo-French Concorde] supersonic jets”, while also reserving “substantially more delivery positions for American SSTs than any other airline”. The report also noted that “Pan Am made the first fully automatic approach and landing in scheduled service” and in the year since, has “completed over 100 of these approaches and landings”. The Boeing 707-321 was in the center of it all. It flew everywhere on Pan American’s routes, and all together 120 of this variant were operated, in addition to the eight 707-121’s and nine 720B’s. The 707-300 series had a longer fuselage, bigger wings and higher-powered engines. With these improvements, which allowed increased fuel capacity from 15,000 gallons to more than 23,000 gallons, the 707 had a truly intercontinental range of over 4,000 miles in a 141-seat (mixed class) seating configuration. The aircraft was later fitted with Pratt & Whitney JT3D turbofan engines that provided for lower fuel consumption, reduced noise and further increased its range to about 6,000 miles. The 707 quickly became the most popular jetliner of its time, and its popularity led to rapid developments in airport terminals, runways, airline catering, baggage handling, reservations systems, and other air transport infrastructure. The advent of the 707 also led to the upgrading of air traffic control systems to prevent interference with military jet operations. 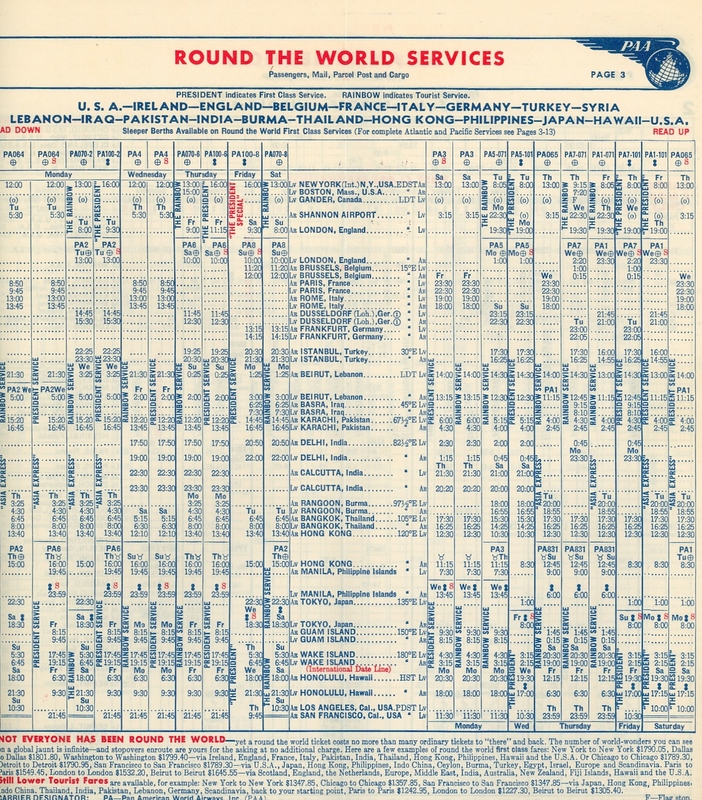 Below is the cover, inside cover, round-the-world schedules and route map from the September 1967 timetable. 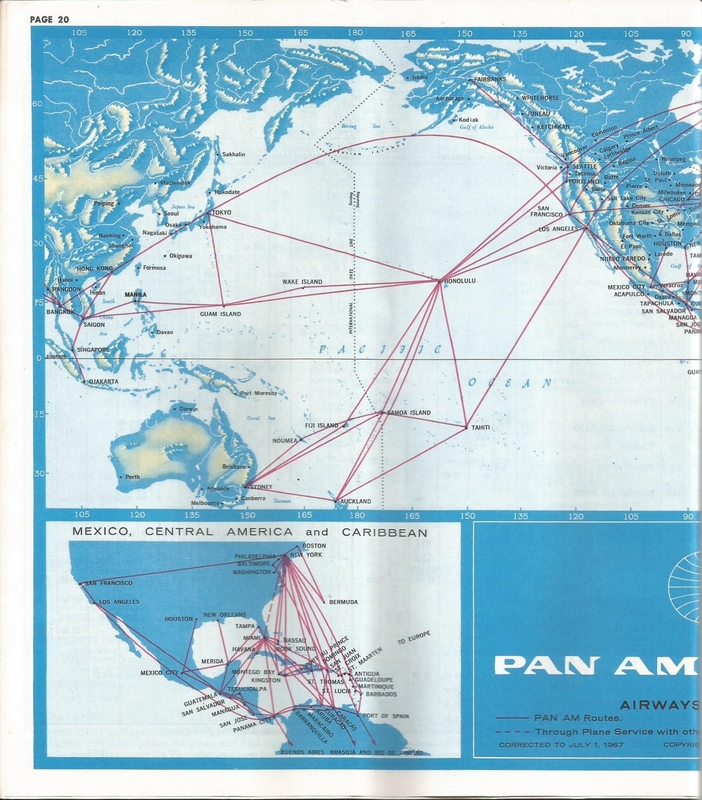 This is a small example of the extent of Pan American’s operations in the 1960s. As the 1960s drew to a close, the exponential growth in air travel led to the 707’s being a victim of its own success. The 707 was now too small to handle the increased passenger densities on the routes for which it was designed. Stretching the fuselage was not a viable option because the installation of larger, more powerful engines would in turn need a larger undercarriage, which was not feasible given the design’s limited ground clearance. The answer to the problem was the first twin-aisle airliner—the Boeing 747. The 707’s first-generation engine technology was also rapidly becoming obsolete in the areas of noise and fuel economy, especially after the 1973 oil crisis. 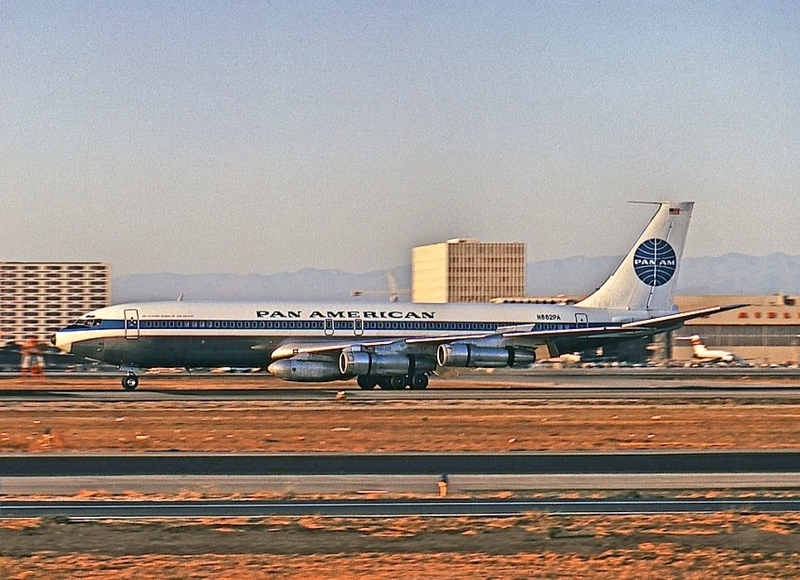 The Boeing 707 brought Pan American to the highest levels of international commercial aviation. It made international travel accessible to more and more travelers and was seen in all corners of the globe. It was, to many of Pan American’s pilots and flight attendants, their favorite airliner, and is cherished in their memories. John T. McCoy’s painting of Clipper America arriving at San Francisco, completing the first commercial airline round-the-world flight, 29 June 1947. With the Fifth Freedom rights granted by Britain in the Bermuda Agreement of 1946, the United States obtained the authority for its international air carriers to pick up passengers in Britain (and in British colonies such as India and Hong Kong) to beyond points in Europe and Asia. What this meant was that Pan American would be able to launch a “round-the-world” service. At the time, with World War II ended, the U.S. international air transportation system was taking on a whole new complexion. 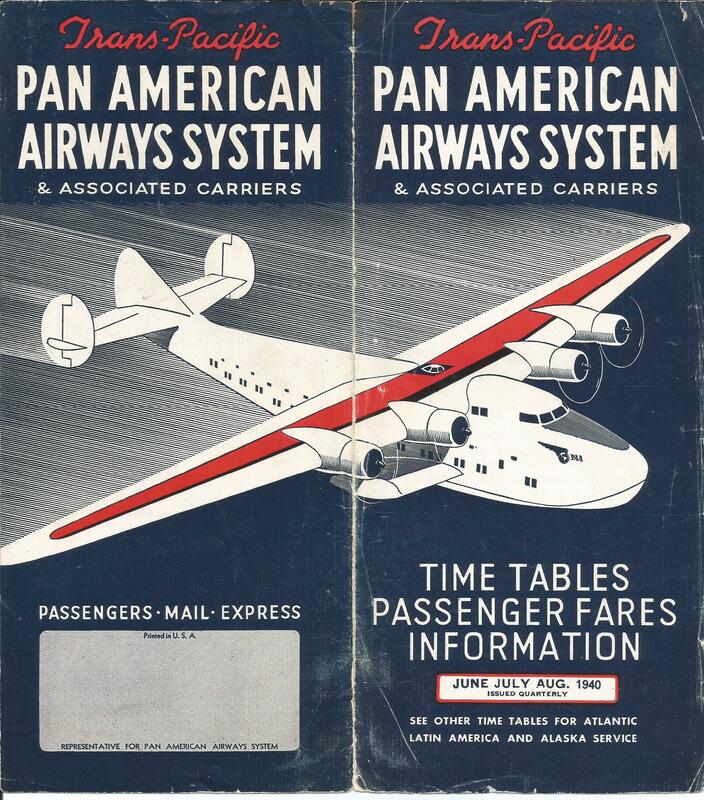 Prior to the war, Pan American Airways was the de facto U.S. flag international air carrier. This was achieved largely by Juan Trippe’s ability to (1) win Foreign Air Mail contracts and (2) negotiate landing concessions with countries of interest. This worked very well in Latin America because for all intents and purposes, Pan American’s activities in the region were in line with the U.S. desire to keep the Germans from establishing any presence there. With the end of the war, however, as a result of their support to the war effort, the Civil Aeronautics Board awarded the likes of TWA, Northwest, United and American Export (AOA, later acquired by Pan American) international routes, much to the chagrin of Pan American. Juan Trippe had fought tooth-and-nail to be the designated U.S. flag international carrier (the “Chosen Instrument”), but was thwarted along the way by politicians and his competition. This story and its political intrigue is covered in detail in The Chosen Instrument, by Marylin Bender and Selig Alschul and An American Saga – Juan Trippe and His Pan Am Empire, by Robert Daley. Nevertheless, Pan American had the beyond authority as granted in the Bermuda Agreement and on 17 June 1947, Juan Trippe departed on the inauguration of Pan American Airways’ round-the-world service, the first for a scheduled commercial airline. The aircraft used was a Lockheed Constellation model 749, Clipper America, powered by four 2.200-horsepower Wright engines, with a cruising speed of 260 miles per hour and a pressurization system that permitted flying at altitudes between 18,000-20,000 feet. Clipper America departed from New York’s LaGuardia airport and stopped in Gander, Shannon, London, Istanbul, Dhahran, Karachi, Calcutta, Bangkok, Manila, Shanghai, Tokyo, Guam, Wake Island, Midway, Honolulu, San Francisco and Chicago, arriving back in New York on 30 June. The journey entailed 22,170 miles. 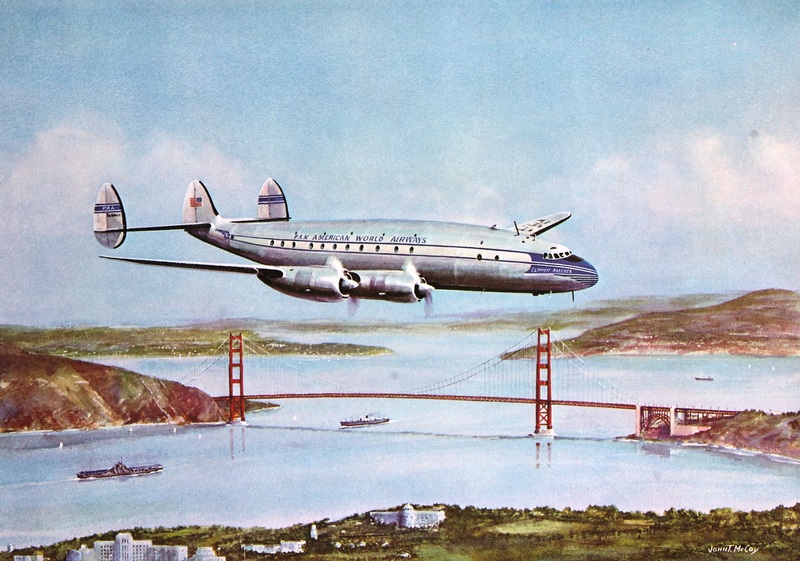 Not having domestic authority, the flight between San Francisco and New York was a “ferry-flight” and thereafter all of Pan American’s round-the-world flights departed from one coast of the U.S. and terminated on the other. 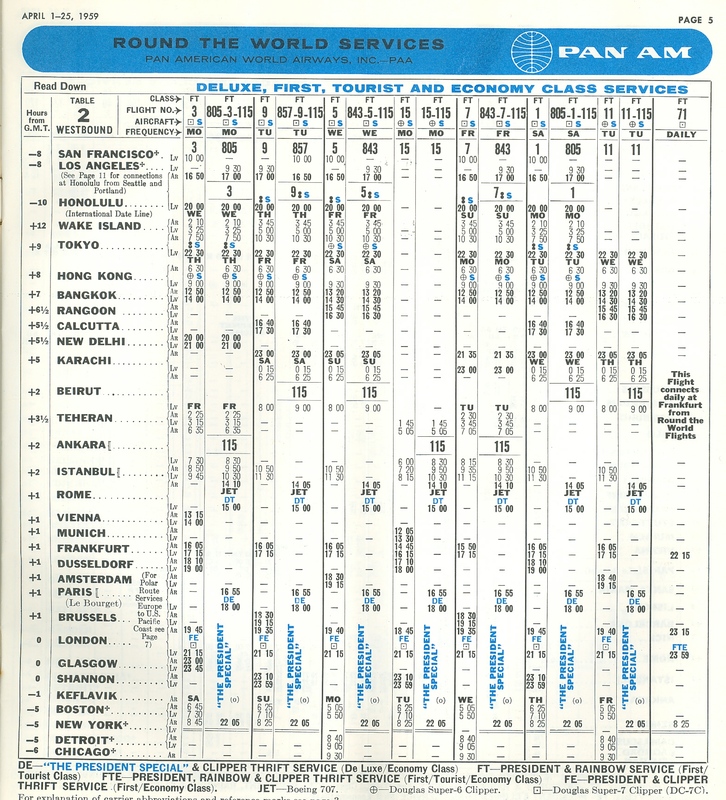 The round-the-world service was a fixture in Pan American’s timetables from then on, until the final round-the-world flight in October, 1982. During this time, the iconic round-the-world flights 1 and 2 represented the summit of Pan American’s power and glory. 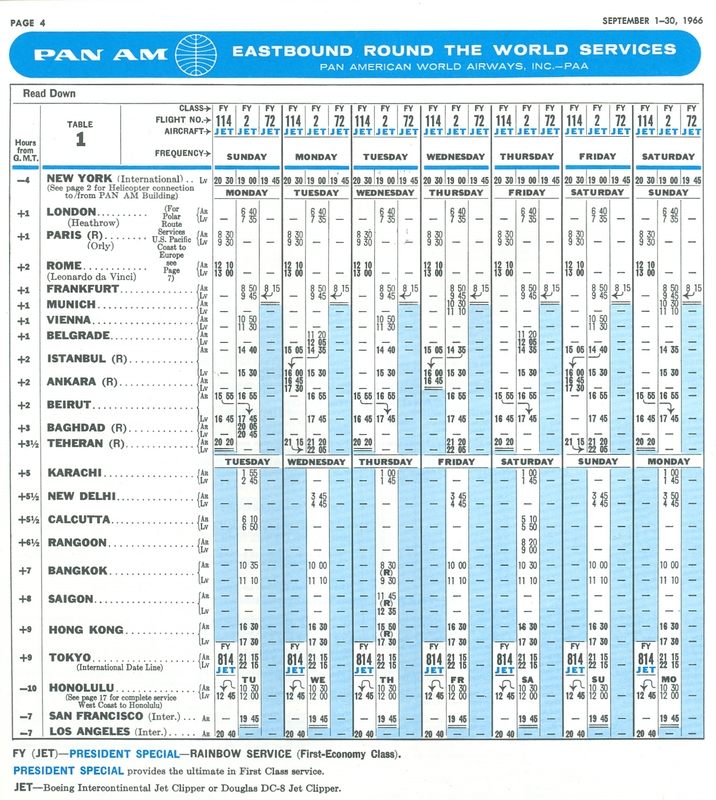 Below are descriptions of Pan American’s round-the-world service from selected timetables over the years. 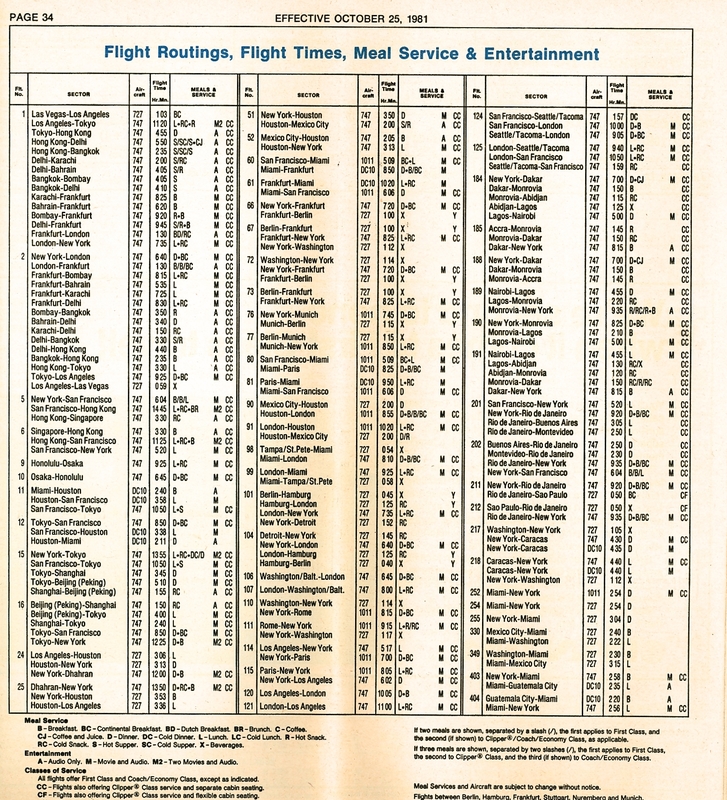 While a variety of flight numbers operated on the route, flights 1 and 2 were a constant and are focused on here. 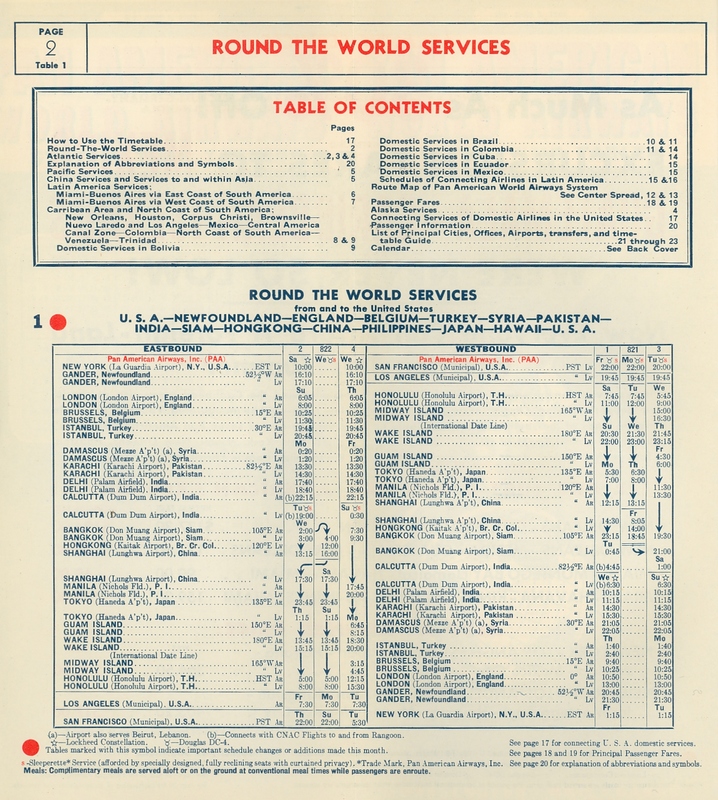 Initially the Constellation and the DC-4 were employed in the round-the-world service, as shown in the June 1948 timetable. On the eastbound flight 2, the Constellation operated from New York to Calcutta and handed over to the DC-4 to continue the route to San Francisco. In the timetable, flight 2 departed New York on Saturday and arrived in Calcutta the following Tuesday, with stops in Gander, London, Brussels, Istanbul, Damascus, Karachi and Delhi. Flight 2 continued its journey to San Francisco, departing Wednesday evening and arriving in San Francisco on Thursday with stops Bangkok, Shanghai, Tokyo, Wake Island and Honolulu. The flight gained a day crossing the International Date Line between Wake Island and Honolulu. The DC-4 from Calcutta featured “Sleeperette Service”, specially reclining seats with “curtained privacy”. Constellation (left, source unknown) and DC-4 (right, PAA postcard). 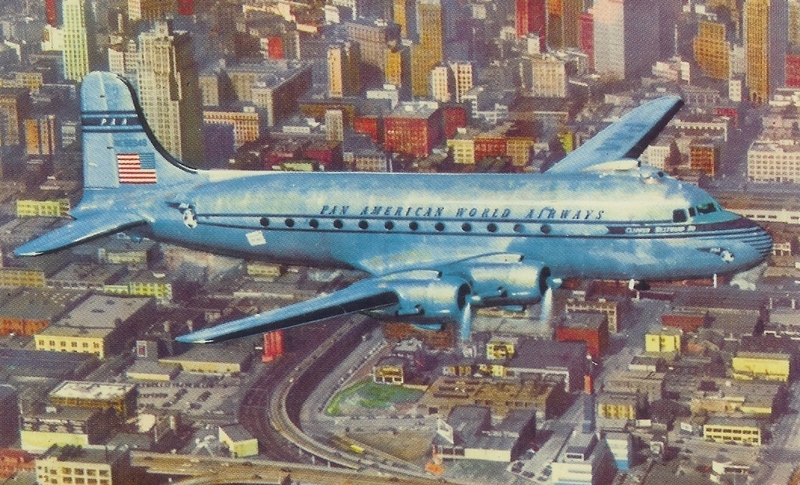 By 1952, the Boeing 377 Stratocruiser (“Strato Clipper”) was deployed into the service as illustrated in the April 1952 timetable. 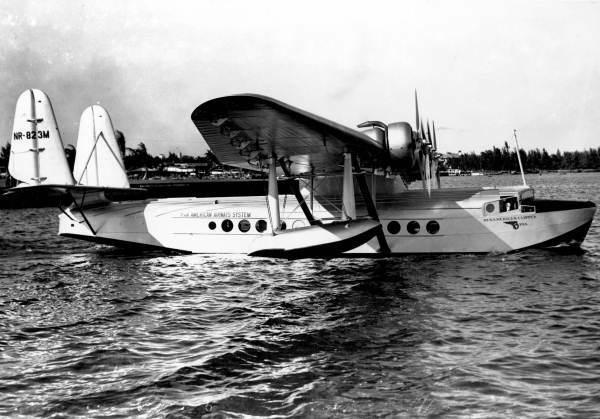 The westbound flight 1, a Strato Clipper, departed San Francisco on Tuesdays and Thursdays, arriving at Manila on Thursdays and Sundays with stops in Honolulu, Wake Island and Guam. The flight lost Wednesday when crossing the International Date Line. From Honolulu, “Sleeperette Service” was offered. Flight 1 changed gauge at Manila to a DC-4, leaving on Fridays and Mondays for Hong Kong, where a Constellation took over on Mondays for London via Bangkok, Calcutta, Delhi, Karachi, Basra, Beirut, Istanbul, Frankfurt and Brussels. The flight arrived in London on Wednesday morning where flight 1 was paired with flight 101 for New York with a Strato Clipper. There were optional fuel stops in Shannon or Gander on this segment. “Strato Clipper” (right, PAA photograph). By 1954, the Constellation was no longer operating this route and the DC-6B had been introduced, offering “Rainbow” tourist service in addition to the “President” first class service. On the eastbound route, flight 2 was paired with flight 70, a DC-6B offering “Rainbow” service and flight 100, a Strato Clipper offering “President” service, on the New York-London segment. Although the service was offered five days a week, flight two only operated on Mondays. 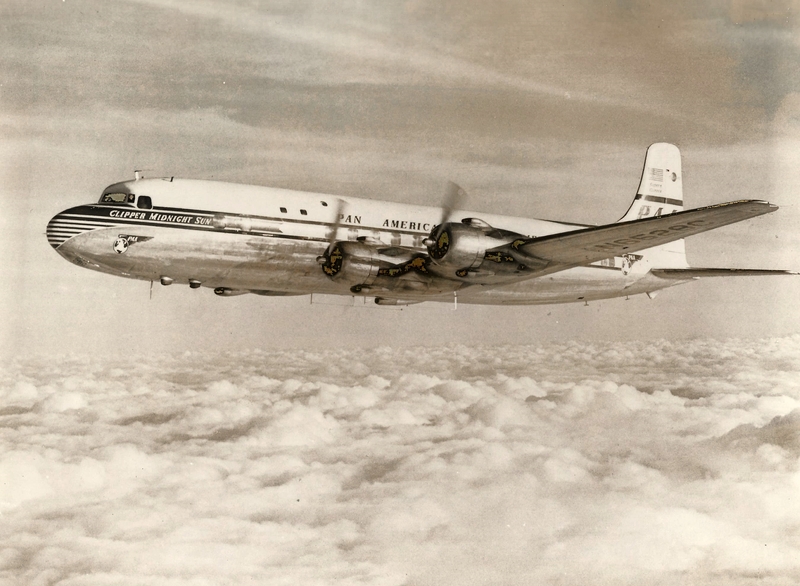 From London, a DC-6B took over and offered both “Rainbow” and “President” service, departing on Tuesday and arriving in Hong Kong on Thursday, with stops in Düsseldorf, Istanbul, Beirut, Karachi, Rangoon and Bangkok. From Hong Kong, flight 2 continued to Tokyo where it laid over until Saturday morning when a Strato Clipper continued the flight to Los Angeles via Wake Island and Honolulu. In addition, from Hong Kong on Thursdays, a DC-4, flight 6, operated to Manila, where a Strato Clipper continued to San Francisco via Guam, Wake Island and Honolulu. By 1956, the Super Stratocruiser and the DC-7B were operating in the round-the-world service. 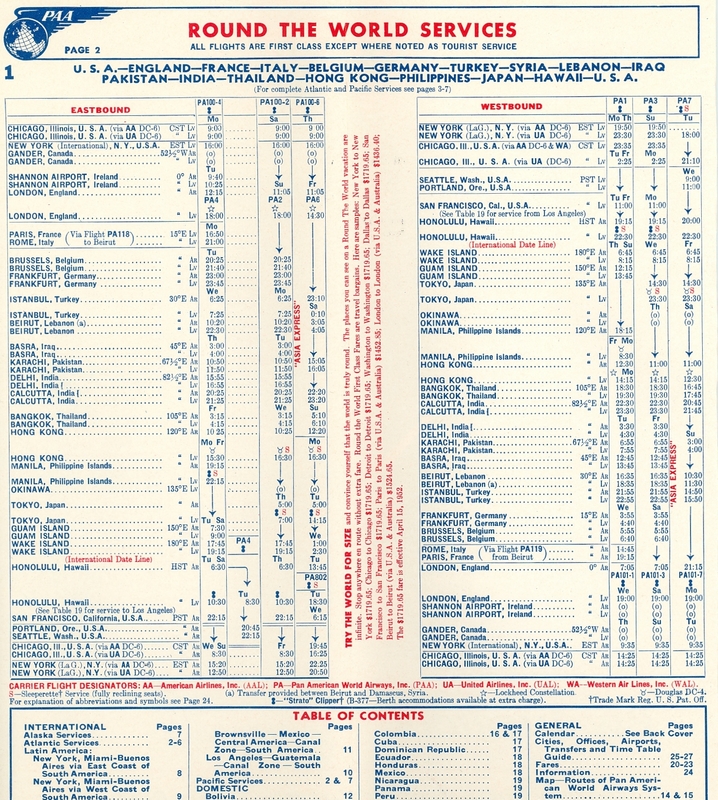 In the April 1956 timetable, eastbound flight 2 from New York was paired with flights 100, 102 and 64. Flights 100 and 102 were Super Stratocruisers departing on Sundays for London with the latter stopping in Boston and Shannon. Both flights arrived in London on Monday and connected to flight 2, a DC-6B, which departed on Tuesday for Tokyo via Frankfurt, Istanbul, Beirut (receiving traffic from flight 64), Karachi, Rangoon, Bangkok and Hong Kong. At Tokyo, a Strato Clipper took over for the remainder of the trip to Seattle with stops in Wake Island, Honolulu and Portland. Flight 64 was a DC-7B that operated from New York to Beirut where it connected with flight 2. The intermediate stops were Shannon, Paris and Rome. 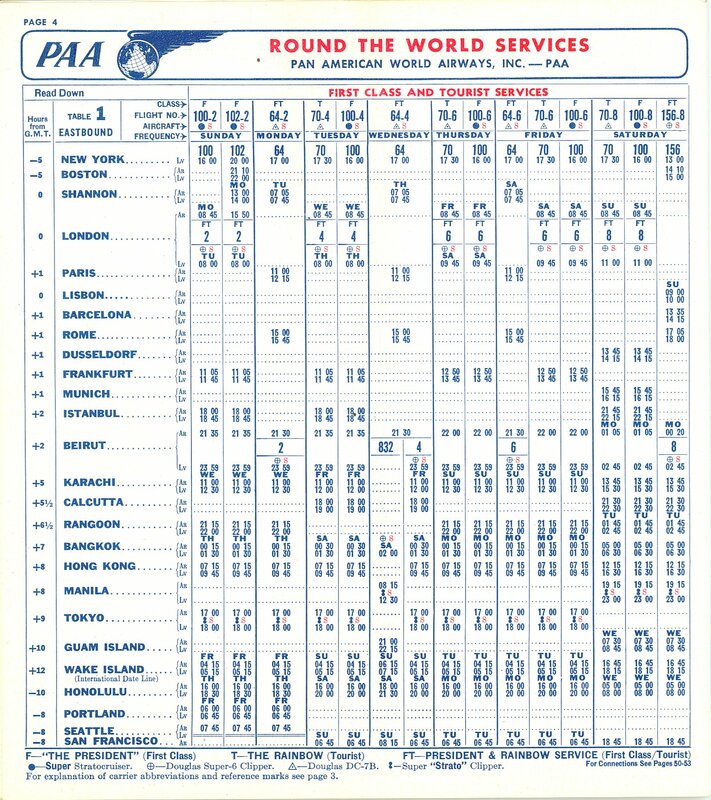 In this timetable, Pan American offered a daily round-the-world service with different flight numbers. With the exception of the service described above, the eastbound flights all terminated in San Francisco. Super Stratocruiser (left, credit R.A. Scholefield Collection) and DC-7B (right, PAA photograph). 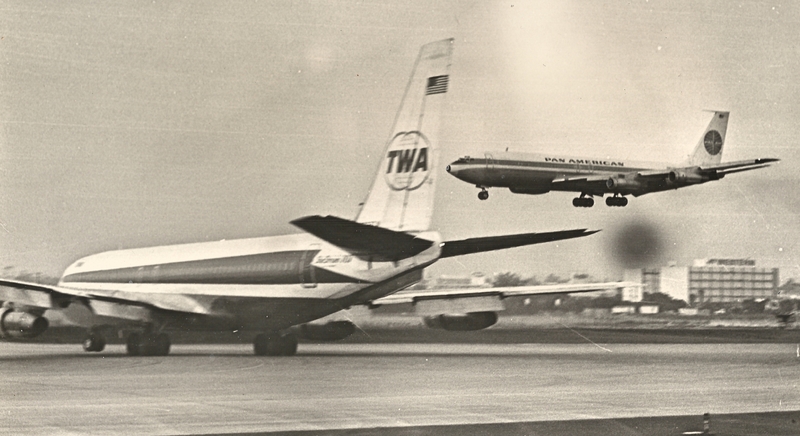 By 1959, the DC-7C and the Boeing 707-121 were seen in the round-the-world service. 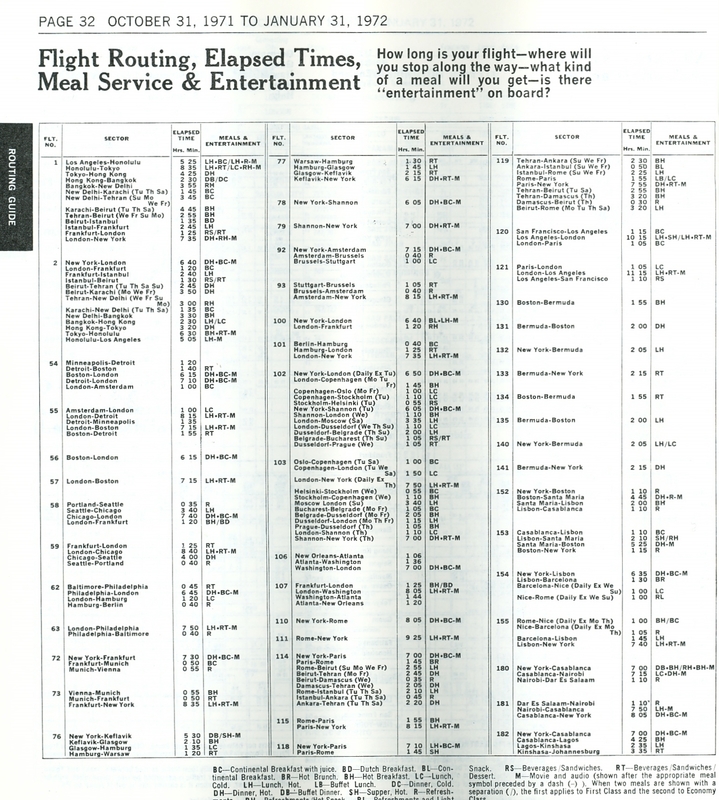 In the April 1959 timetable, westbound flight 1 operated on Saturdays with a DC-7C from San Francisco to Tokyo with stops in Honolulu and Wake Island. 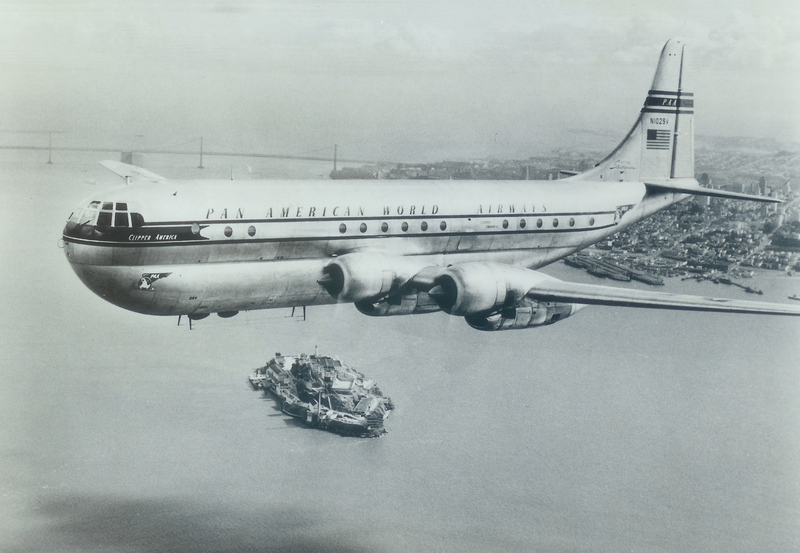 Flight 805, also a DC-7C, operated on Saturdays from Los Angeles to Honolulu, where it connected to flight 1. “Sleeperette Service” was available on both segments. Flight 1 arrived in Tokyo on Monday where a Strato Clipper took over for the segment to Hong Kong where the flight was handed over to a DC-6B. This aircraft continued to London with stops in Bangkok, Calcutta, Karachi, Beirut, Istanbul, Frankfurt and Düsseldorf. From London a DC-7C took over for the trip to New York, with stops in Shannon and Boston. In Beirut, flight 1 also connected to flight 115, a service to New York via Rome and Paris. From Beirut a DC-6B operated to Rome. From Rome, a Boeing 707-121 operated to Paris and then on to New York. 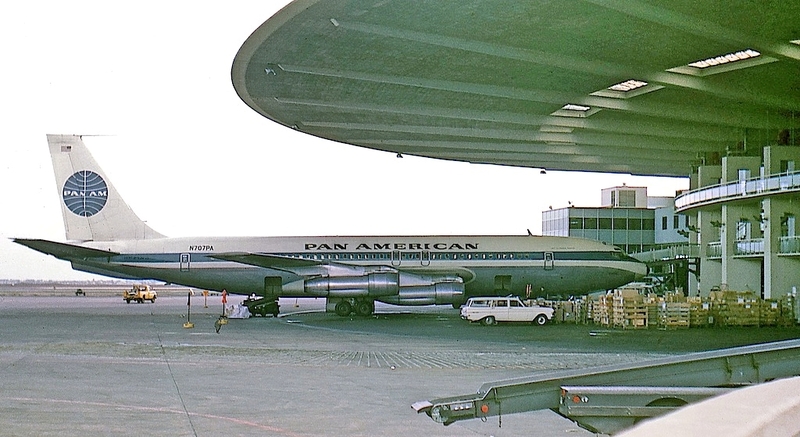 DC-7C (left, photo by Allan Van Wickler) and Boeing 707-121 (right, photo by Jon Proctor) at New York. By 1966, the Boeing 707 and DC-8 were operating a daily all-jet round-the-world service. On Sundays, flight 2 departed New York in the evening and arrived in San Francisco on Tuesday via London, Frankfurt, Vienna, Istanbul, Beirut, Baghdad, Karachi, Calcutta, Bangkok, Hong Kong, Tokyo and Honolulu. Other stops on the route, depending on the day operated, included Belgrade, Ankara, Tehran, New Delhi, Rangoon and Saigon. By 1971, the Boeing 747 operated flights 1 and 2, between New York and Los Angeles with stops in Honolulu, Tokyo, Hong Kong, Bangkok and, depending on the day, New Delhi, Karachi, Tehran or Beirut, and then Istanbul, Frankfurt and London. After the merger with National Airlines, flights 1 and 2 continued in round-the world service between New York and Los Angeles with 747s, with stops in Tokyo and Hong Kong, and, depending on the day, Bangkok, Delhi, Bombay, Karachi or Bahrain, and then Frankfurt and London. The service also added Las Vegas to the route with a change of gauge to a 727 for the flight from/to Los Angeles. Boeing 707-321 at New York (top left), DC-8-32 at Los Angeles (top right), Boeing 747-121 at Los Angeles (bottom). Photographs by Jon Proctor. 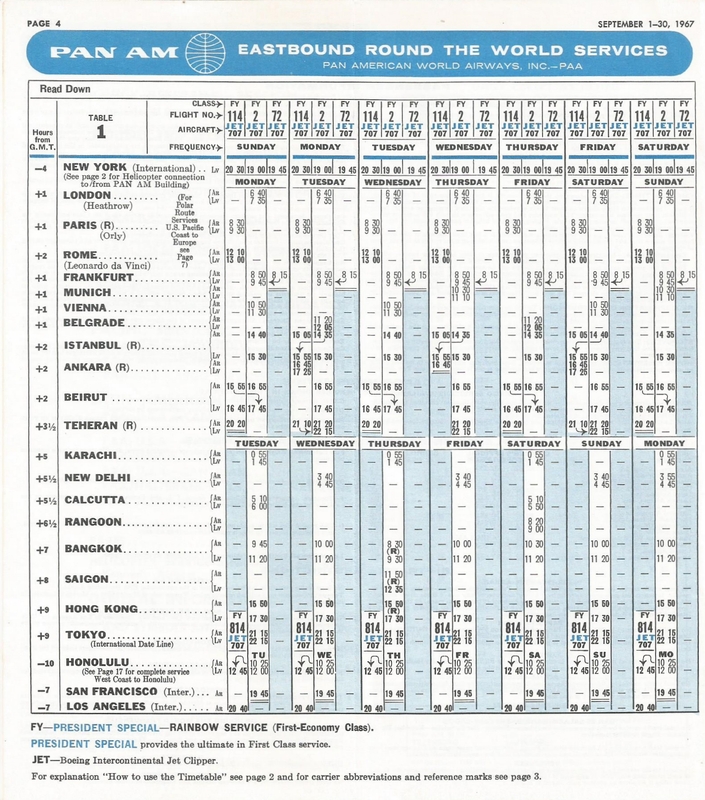 By the end of 1982, Pan American’s iconic round-the-world service was history. Although flights 1 and 2 continued to operate, the service was between New York and London and onward to points on the European continent. With the sale of Pan American’s London Heathrow route to United Airlines, flights 1 and 2 were removed from the timetable. “They say when French writer Jules Verne wrote Around the World in 80 Days in 1873 it was during a financially difficult time for the classic adventure novelist. Compared to Pan Am’s travails, it was no sweat. He couldn’t have been as financially bad off as Pan Am was over a hundred years later when the airline decided to end its historic Round-the-World Flights One and Two. But whether it was Verne’s novel, which I had read many years earlier, or perhaps Nellie Bly’s 1889 epic 72-day tale which she wrote for her newspaper, the New York World, I was awed by their feat and saw the last Pan Am RTW flights as my final opportunity. 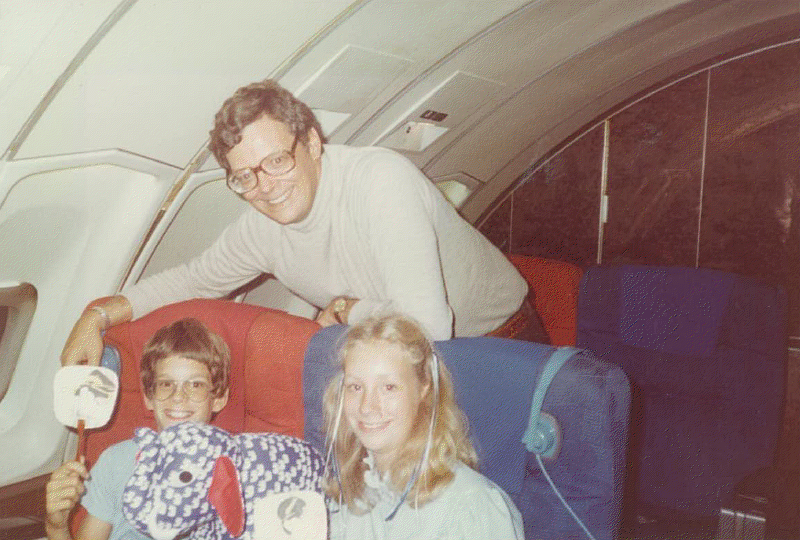 “So it was on a fall evening in 1982 during dinner with my family that I announced that I was going to fly around the world that coming weekend, leaving October 27, 1982, and listened as my 14-year- old daughter Diana quickly asked if she could join me, followed later by my 12-year old son Dwight. Not sure that they understood the magnitude of the undertaking, I explained that the curtailing of Pan Am’s Flights 1 and 2, which had been operating since June 17, 1947, represented surrendering what many considered the most symbolic aspect of the airline. No other airline in the world had previously ever even attempted to make round-the-world service commercially viable. And we would be on the last flight! “Not only we would be on the final flight, departing Los Angeles that Friday at noon, I told Diana and Dwight that if anybody in recent history had boarded Flight 1 and remained with the plane for the entire duration of the flight until it landed at JFK in New York on Sunday afternoon, I and others I queried, were unaware of such a back-breaking marathon. “With the advent of jet service in 1958 with the Boeing 707, Pan Am switched departure city of Flight 1 from San Francisco to Los Angeles. Thus the route of the flight would be Los Angeles-Tokyo-Hong Kong-Bangkok- Bombay-Dubai-Istanbul-Frankfurt-London-New York on a Boeing 747. “And so on Friday, October 28, 1982, with Capt. Carl Wallace in the left hand seat, we joined the world of Verne and Bly. * * * For Diana and Dwight, the RTW trip was an unparalleled emotional and educational experience. “Some two full days after takeoff in Los Angeles we landed in New York on a brilliant sunny fall day. We had made it in one piece after 56-hours of flying. We had eaten the best airline food in the world (more breakfasts than dinners when you fly west to east). . . [a]nd yes, Diana and Dwight even did some of the homework they brought with them. “The year was 1966. The war in Southeast Asia had been simmering, percolating just below the boil for more years than we cared to count. 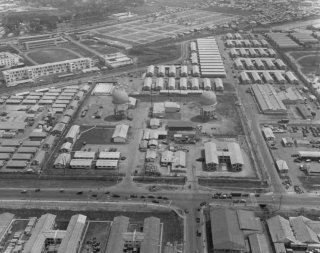 By 1966 enough troops and materiel had been amassed in that poor and backward corner of the Third World that it was time for the commanders to seriously look at relief for some of the longer serving units. It only made good sense that instead of rotating entire units back stateside they would be given a hiatus from the awful conditions under which they lived and fought, and the war-weary GIs would be afforded the opportunity to sample the cultural diversities of the cities of East Asia. The operation was to be called ‘R & R’, standing for Rest and Recuperation. It would require the use of enough commercial airliners to carry GIs out of Vietnam to the bright lights and flesh-pots of Asia, set them down for a week, and re turn them to the war zone to fight again. It was one of the only sensible decisions made by American commanders in that most unfortunate of wars. “Pan American Airways at the time was in a transition of equipment from the venerable propeller-driven transports of the fifties and early sixties to the jets which would eventually take over the skies. The last hurrah for the DC-6 at Pan Am was the Internal German Service, based in Berlin, and even now that venerable airliner was rapidly being replaced in Germany by the sparkling new Boeing 727s. As the 6’s were replaced they would be headed for the backwaters of aviation; to South America and Africa, there to spend their dying years carrying livestock, heavy equipment for distant oil fields, or worse; ending up forgotten and decaying in the corner of some airplane boneyard. But wait! There was indeed one more mission, one more humanitarian task they could perform. Pan Am’s DC-6s were offered to the government under contract to carry GIs to R & R for cost plus a dollar. How could any sane government functionary refuse? “And so it came to pass that the old Douglas’s made a slight detour on their way to pasture. They would rumble out to Hong Kong where they would form the backbone of Pan Am’s contribution to the war effort. Since the only DC-6-qualified airmen in Pan Am’s system were those in Berlin, flying out the days of the last pistons, it fell to us to man the new operation while newly-hired crews were trained and sent to Asia. We jumped at the chance to escape the dreary northern European weather and sample the exotica of Asia and the Pacific rim. “After a flurry of government-mandated paperwork, mostly involving visas, inoculations and other tiresome functions , we departed in twos and threes, embarking for the long tortuous flight aboard Pan Am’s famous Flight Two, boarding at Frankfurt and finally coming to ground many sleepless hours later on another planet. We were in Hong Kong! “After a suitable period of decompression and recovery from a first degree case of jet lag, we were ready and raring to go. The mission was deceptively simple. Battle-hardened and frazzled GIs were pulled from the war zones and sent to one of several embarkation points. Da Nang, Cam Ranh Bay, Nha Trang, and Tan Son Nhut Airport in Saigon were the most prominent. The men were loaded aboard and flown to any one of a number of Asian cities for a week’s R and R. Hong Kong, Tokyo, Taipei, and Singapore were the initial destinations; other cities were added as the program grew. Through a complex set of negotiations with the governments involved, immigration and customs formalities were kept to a minimum. 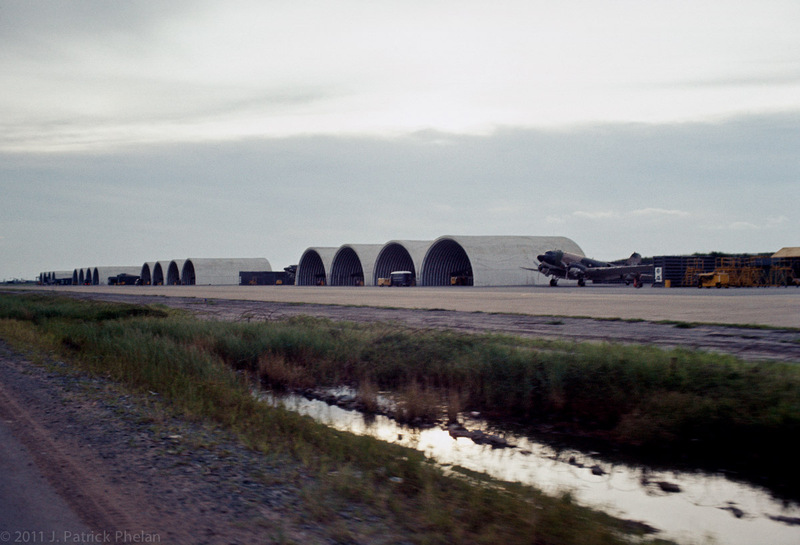 Once the operation was up and running it was simply a matter of taking a load out of Vietnam, and bringing a load back. Needless to say the mood in the cabin peaked at wide extremes depending on whether the trip was headed out or back. The airline pulled out all the stops in the catering department. Kobe beef steaks, French fries, lots of cold milk and all the ice cream one could possibly eat made up the meal of choice. The flight crews dined on the same fare, but even for us such extravagant cuisine paled after a while. On about the third day of a six day trip we began to wish for chicken, or even fish — anything to break the monotony of such sumptuous gluttony. “After a quick course in long-range operation of the airplane, we were thrown into the fray, and embarked on our first trips. None of us flight engineers had flown the airplane on a leg longer than two hours; in Europe the fuel requirements and the short flights in the ‘6 were simplicity itself. Some gas in the mains, off you go, and Bob’s your uncle. But hidden perils lurked behind the innocent conduct of a flight from Hong Kong to anywhere. Any reader who has ever had a passing acquaintance with Mr. Douglas’ piston airplanes knows what a labyrinthian maze their fuel systems could be. I learned the hard way early on. “On a flight from Saigon to Taipei we carried fuel not only in the mains, but in the auxiliaries and reserves as well. (Ancient piston drivers, bear with me. Memory may not serve with total accuracy the nomenclature of the tanks, but you get the idea.) After top of climb we settled into the cruise routine for the long flight across the South China Sea and the Western Pacific. Mixtures were carefully leaned and spark advance set. After a bit it was time to reset the fuel panel. This was located in front of the center pedestal, behind the throttles and propeller controls. There were long levers which controlled the shutoff valves in each tank, and depending on the fuel load, there were a stupefying number of combinations with which to set the tank feed. The flight engineer (me) had to lean way over the pedestal in order to reach the controls. The captain on this trip was a laid-back old-timer who smoked a pipe (still acceptable in those days) and he leaned back in his seat and watched my efforts carefully. Tendrils of blue smoke curled gently from the smoldering briar and wafted over my shoulder. Finally satisfied, I sat back smugly. “It wasn’t long before the skipper disengaged himself from his seat and disappeared aft. I clamored up onto his throne and settled in to enjoy the view from the best seat in the house. The sea below was a shimmering slate, and the sky ahead was dotted with puffy cumulus. How could life get any better than this? I was soon to find out. “Half an hour passed, and the flight deck settled comfortably into the ennui of a lengthy overwater trip. The first officer was absorbed in a manual of some sort, and I gazed out the window at my side. The captain was a garrulous sort, and had not returned from the passenger cabin. Suddenly our reverie was rudely shattered by the barking cough of the number 1 engine, followed by a series of backfires in quick succession. We shot bolt upright in our seats as the number 4 quickly followed suit. I reached down and slammed the mixtures to full rich, while staring at the panel of engine instruments. The fuel pressure gauges caught my eye, primarily because the needles on the outboard engines were wildly careening around the dials. The first officer grabbed the wheel and disconnected the autopilot, at the same time exclaiming, ‘Fuel panel! Check the fuel panel!’ Startled, I reached over and slammed all the fuel valve levers to the forward position, opening all of them. After an eternity, while we gently massaged the throttles and mixtures, the outboards finally caught and resumed their healthy roar. My heart settled down to a trip-hammer rate, and I wiped beads of sweat from my brow. In a moment I was composed enough to get out the book and carefully reset the fuel feed. “Suddenly I realized that the captain had not reappeared. I looked aft through the open cockpit door and saw him slowly sauntering forward. He stopped in the entrance and shifted the pipe from one side of his mouth to the other. He gazed at me without saying anything. ‘Little screw-up in the fuel sequencing,’ I stammered, shame-faced. I unfolded myself from his seat to let him back in. “‘Well,’ he drawled, after he had settled himself. ‘I didn’t think it looked exactly right, but I figured you probably knew what you were doing, so I didn’t say anything.’ It was an abrupt and exciting initiation into the oceanic operation. “I took a healthy ribbing from the flight attendant crew on our way to the hotel in Taipei. They were a venerable, uninhibited bunch, not above exploiting the chinks in the veneer of cockpit crew perfection with mirth and enjoyment. The following night the wet-behind-the-ears flight engineer was to have another adventure, although nowhere near as heart-stopping as starving two of the airplane’s four engines of fuel. “We were the same crew, departing Taipei just at dusk for the five-hour flight to Yokota Air Base outside Tokyo. By the time we levelled off in cruise full darkness had fallen. We flew in an ocean of black, the sky above dimpled with stars that shed just enough light to outline the occasional cloud formation. After dinner the skipper again went back into the cabin to socialize, and once again I occupied the left seat. This time I had made double sure of the fuel feed sequence, and the four big Pratts rumbled along contentedly. I gazed below into the blackness, and then sat abruptly upright in the seat, heart pounding. Now I am pretty good at world geography, and I knew without really thinking that if one flew straight from Taipei to Tokyo the trip was all over water. But here we were over land, and there was a major city below us, or at least a good-sized town. Good God, we had strayed over mainland China! A curious tingling sensation began between my shoulder blades, in immediate anticipation of a barrage of .50-caliber bullets that I was sure any second would slam into the defenseless Douglas. We would fall victim to the Red Guards and the Cultural Revolution! “Eyes opened wide in startled surprise, Clyde looked around hurriedly, straining to get his bearings. I pointed frantically downward at the thousands of lights that stretched to the horizon. Before I could say anything more, he looked over the side for a long moment, then settled wearily back in his seat. A long sigh escaped his lips. ‘Fishing fleet, John. Just fishing boats. They’re all over the ocean around here.’ In a moment his head nodded chest-ward and silence once again engulfed the cockpit. “Operating in and out of Saigon’s Tan Son Nhut Airport was an experience unto itself. It was like no other airport in the world. 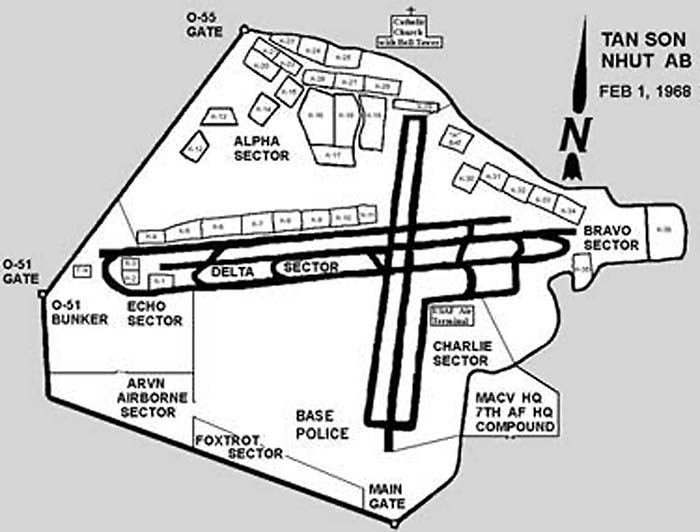 While the other strips that we flew out of were primarily military bases, the airport at Saigon wore many faces. 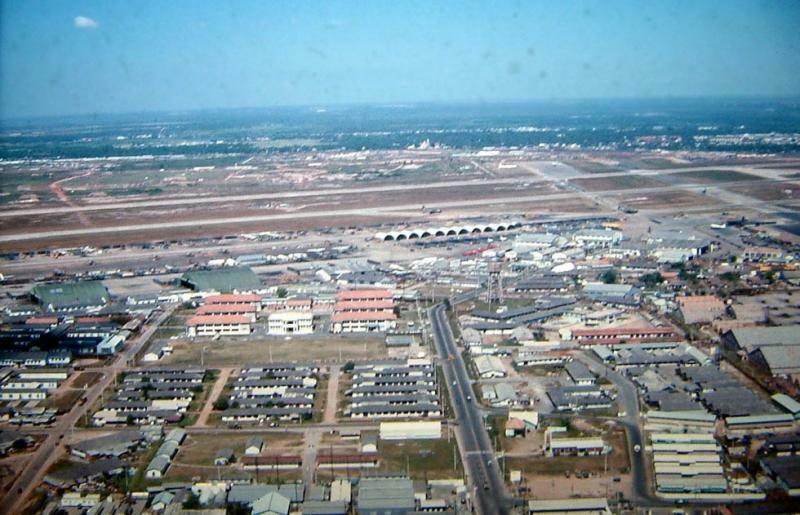 It bravely attempted to be a commercial airport like any other, with everyday airline operations trying valiantly to pretend that things were normal, coexisting with the maelstrom of military hardware fighting a war swirling around them. Even Pan American sent its 707 round-the-world flights One and Two into Tan Son Nhut on a weekly basis. Most of the time the airport made O’Hare look like a sleepy country strip. The ramp was an overwhelming place. 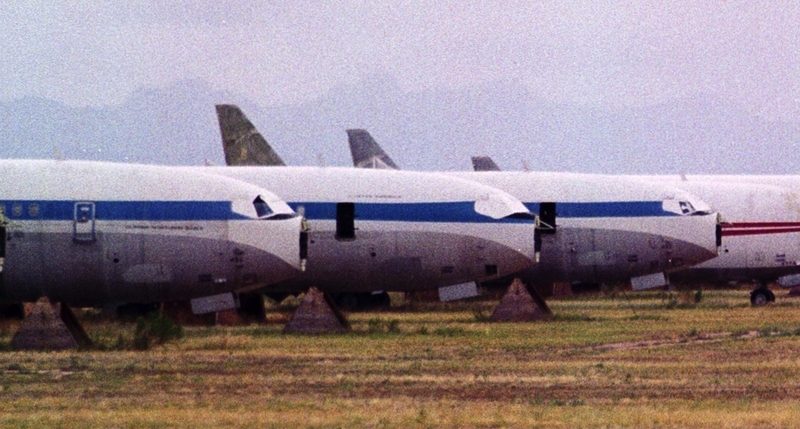 707s and DC-8s under military charter carried troops and materiel in and out; military C-130s from countless different squadrons and with just as many esoteric missions kept up a steady stream as they taxied to and fro, their unique rumble trembling the gut as they passed. Helicopters of every description, led by the workhorse Hueys, buzzed like malevolent insects. There were Vietnamese Air Force fighter units based there as well, flying ancient hardware that has a habit of trickling down to the Third World. Venerable C-47s and C-46s completed the mix, along with the occasional B-26. “The airport had intersecting runways, which proved to be a mere annoyance, as operations were conducted simultaneously on both. Controllers took great pride in threading the needle at the intersection, seeing just how close they could cut it. Occasionally a flight of fighters would return with one or more of their number shot up, requiring the controllers to break out all the existing traffic until the wounded had safely landed. This resulted in a fur-ball of major proportions orbiting near the field, each pilot jockeying for position when the field re-opened. The controllers were native Vietnamese, some with limited language and/or controller skills. The sheer volume of traffic would have been daunting to an experienced journeyman, and at times the local controllers were simply overwhelmed. It was then that the down-home drawl of a GI controller would come on the mike, and laconically unravel the havoc. When things had returned to some semblance of normal (a relative term), back came the Asian controller to begin the process all over again. “The normal entry into Tan Son Nhut used by the big transports was called a ‘Canyon Approach’. It called for the initial approach to be made at 5,000 feet above the field, an altitude safely out of range of snipers perched off the end of the runway. Once the runway had nearly disappeared under the nose, gear and full flaps went down, and the props into fine pitch. Over went the nose, pointing straight at the touchdown zone. It was a maneuver that demanded great skill and the courage to wait until the very last minute to complete. It was exciting to sit through, particularly the last few feet before the flare. “Once safely on the ground and disembarked, Tan Son Nhut assaulted all the senses. The heat and humidity were unlike any other in Southeast Asia, and the noise and clamor and hubbub were nearly disorienting in their sheer intensity. Quickly in and quickly out was the name of the game; not only was ramp space at a precious premium, but the longer on the ground the greater exposure to dangers unknown. 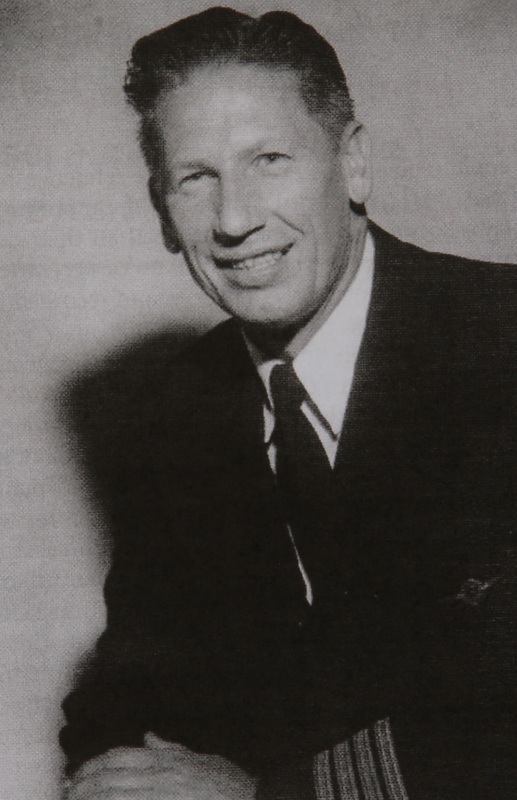 Pan Am Captain John Marshall attended Deerfield Academy, Stanford University and served in the US Air Force in preparation for his distinguished career with Pan Am. He was based in Hong Kong, Sydney, Berlin, San Francisco and served as Chief Pilot of the Honolulu base a.k.a. “the Royal Hawaiian Flying Club”. He received the civilian Desert Shield and Desert Storm medal for flying military troops and materiel in support of Operation Desert Storm, and finished his Pan Am career commanding the last 747 revenue flight from South America-Sao Paolo to JFK. John retired as a 747 Captain with Korean Airlines. He was recently presented with the prestigious Wright Brothers “Master Pilot” Award, and is enjoying his membership with fellow Quiet Birdmen. John’s writings and columns have been published and featured for a number of years in Smithsonian Magazine and Airways Magazine, and he keeps in shape flying a WWII B-25 Bomber, “Show Me”. John presently works for the FAA as an Aviation Safety Inspector in St. Louis, MO, where he resides with his wife, Carla.